E.G.R. 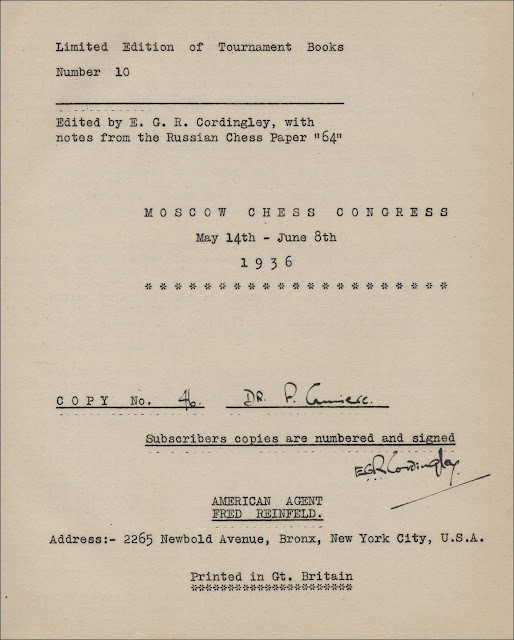 Cordingley launched his series of Limited Editions in the Summer of 1933 shortly after sending a letter to The British Chess Magazine, (May 1933, page 204), deploring the loss of the game scores from many tournaments, and appealing for a "Circle of Chess Votaries" willing to support his scheme for printing the games from interesting events. His first book covered the Hastings Christmas Tournament 1932-33 and only 30 copies were printed. Cordingley's second Limited Edition on Frankfurt 1930 was published in an edition of 40 copies towards the end of 1933 and he again wrote to The British Chess Magazine, (November 1933, page 505), seeking a permanent body of subscribers on whose support he could rely. At the time he had 28 subscribers, and this had increased to 47 when his third book, on Liege 1930, was published in the Spring of 1934 with 61 copies. 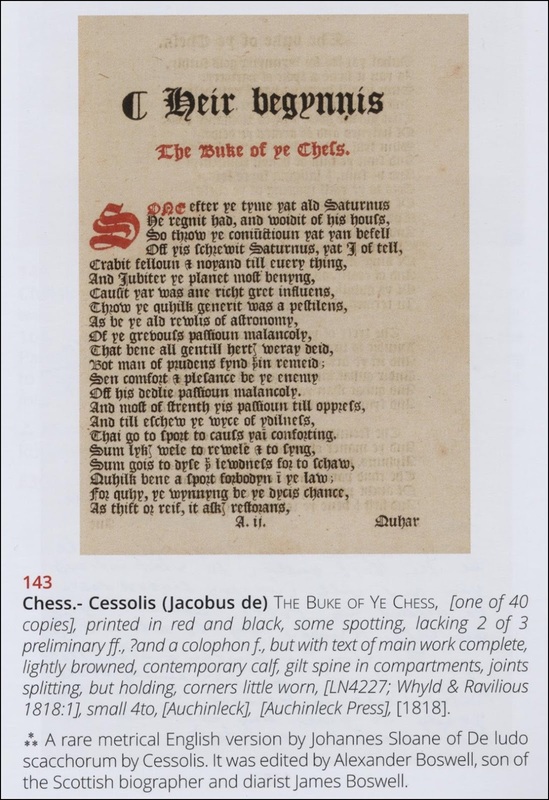 It seems that Cordingley's intention in printing such small numbers of his earliest books was simply to cover the costs of supplying the demand of his modest circle of subscribers. 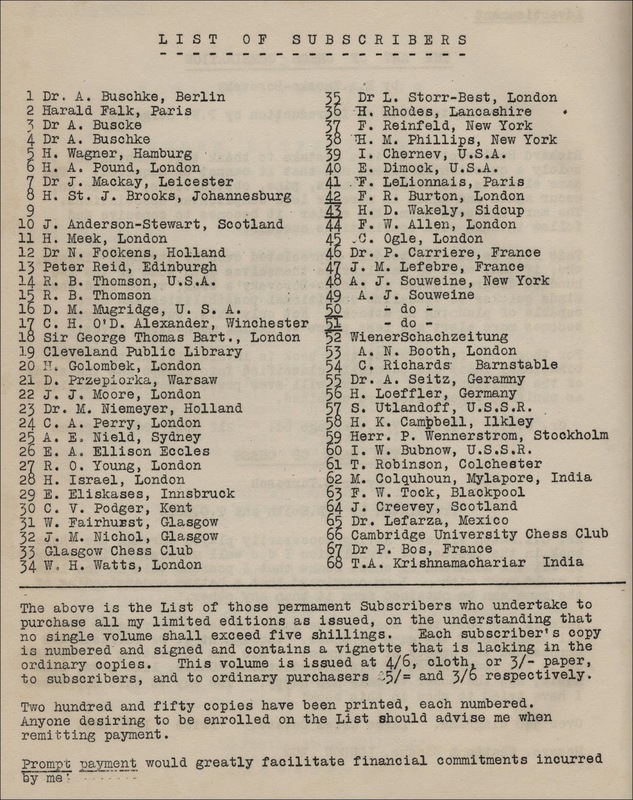 However, in his very interesting article; E.G.R Cordingley, Publishing Pioneer, in the December 1999 issue of Chess, Ken Whyld opined that his friend and associate "saw that by limiting and numbering his publications, his customers were assured that their investments would not depreciate, and indeed he offered to buy back at the original price"
I do not possess any of the earliest Limited Editions, my first is number 7 in the series, Moscow 1935, volume I, published in May 1935, 250 copies. 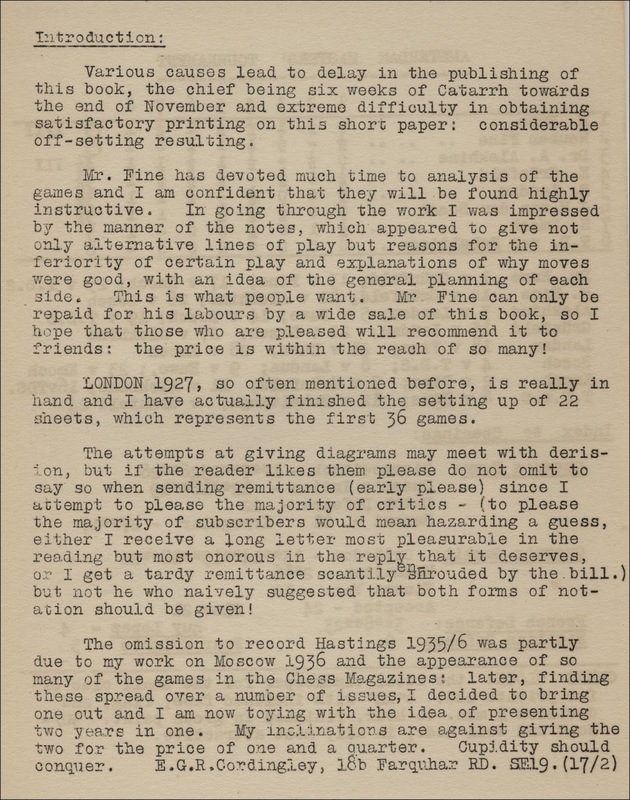 In his Foreword, Cordingley acknowledges the assistance provided by R. N. Coles and Dr. Lloyd Storr-Best who translated the notes from the Russian daily bulletins and also wrote the Preface painting the background to the tournament and describing the extraordinary interest it generated in Moscow. 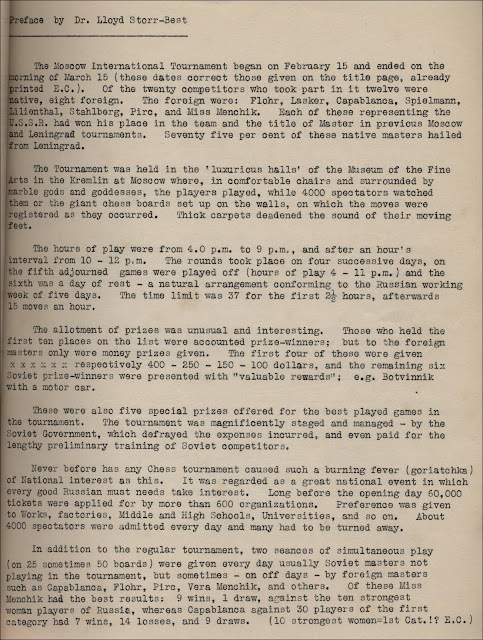 4,000 spectators filled the playing hall every day. 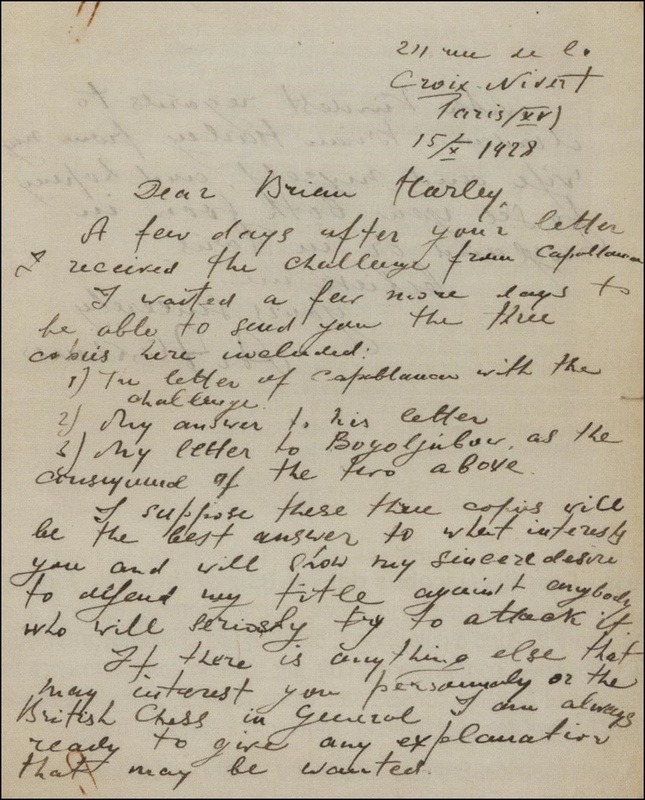 Cordingley also offered to buy back copies of his first three books, and mentioned that only about 25 people possess the complete set of his Limited Editions. 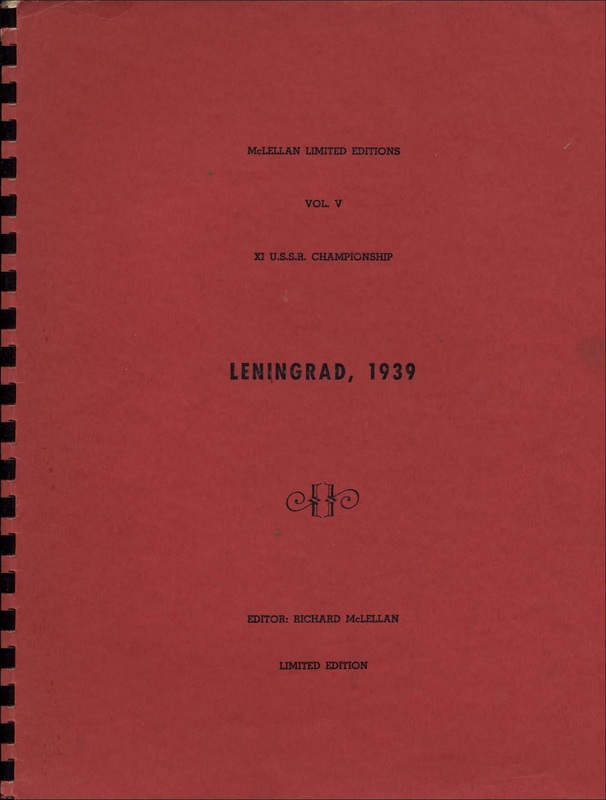 Volume I of Moscow 1935 covers the first ten rounds of this famous tournament, after which Botvinnik was leading ahead of Flohr, Em. Lasker, Levenfish, Ragosin, Capablanca etc. 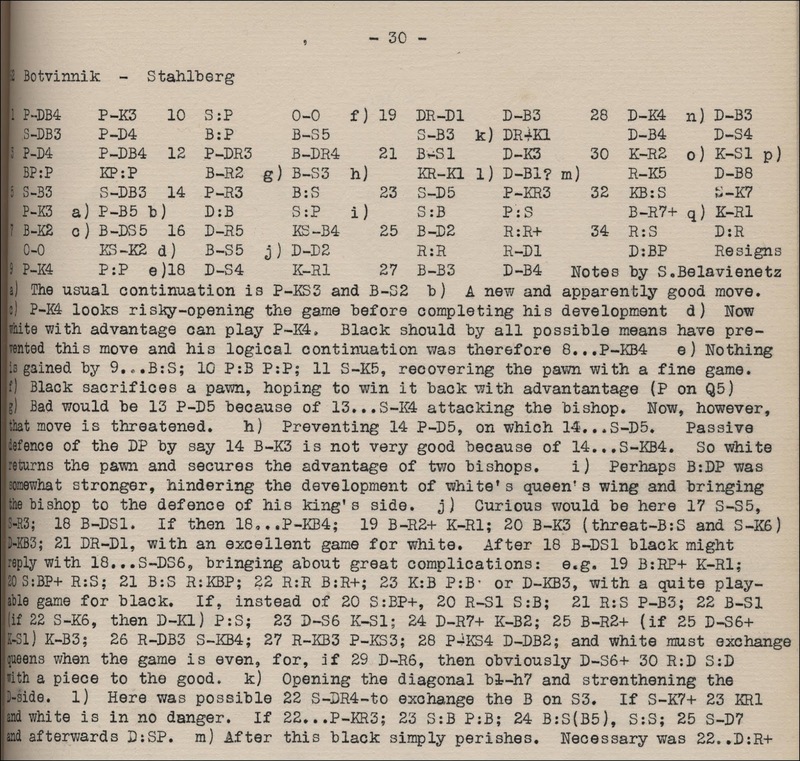 Here is the game between Botvinnik and Stahlberg in Round 7. 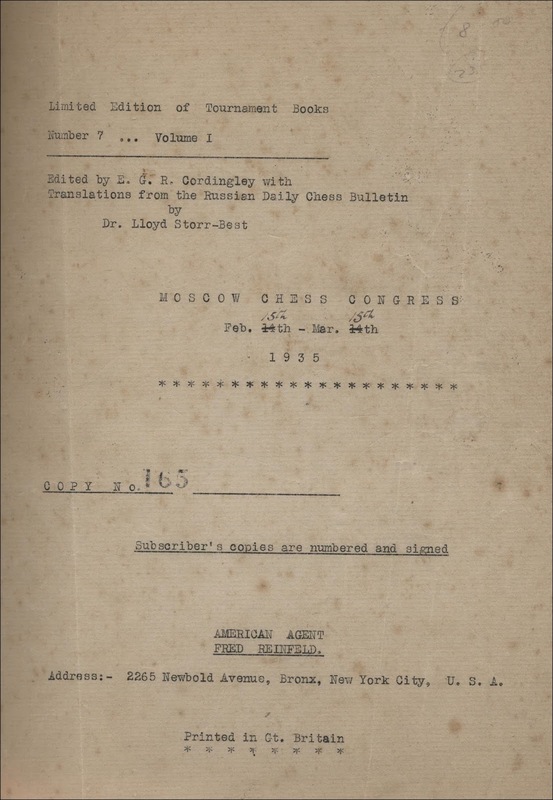 Number 10 in the series is Moscow 1936 and I have a subscriber's copy which is numbered and signed by Cordingley. Subscriber's copies also included the vignette shown at the top of this article. The title page includes details of Cordingley's American Agent, Fred Reinfeld, and Ken Whyld states in his Chess article that Limited Editions 4 to 10 (excluding No. 9) were produced jointly with Reinfeld; in fact Cordingley No. 8 and Reinfeld No. 3 on Margate 1935 are the same book. Cordingley No. 9, on Dresden 1936, was a German publication reissued with an English title page. In Moscow 1936, most games are given in Continental notation with notes at the end, making the games a little difficult to follow smoothly. There was no No. 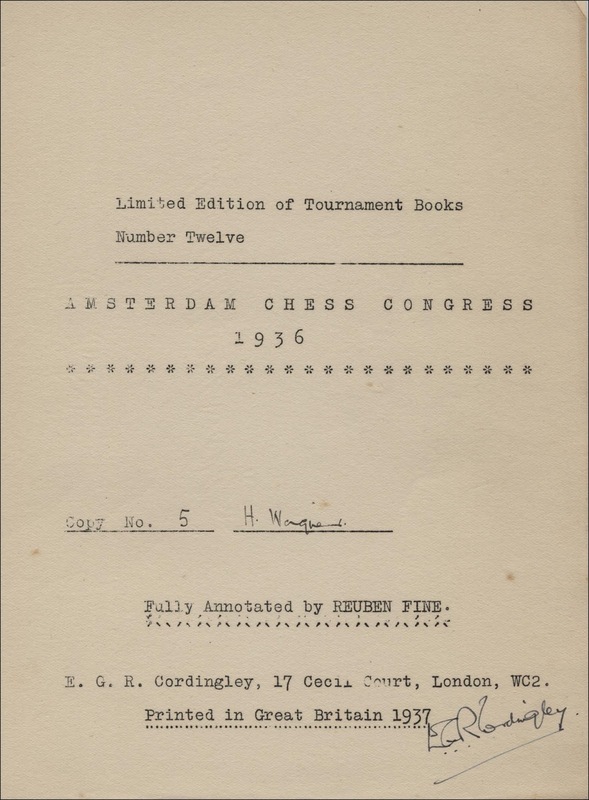 11 in the series but when Ken Whyld purchased Cordingley's library in 1952 he found that it included the stencils for Budapest 1921 which he supposed were intended to be used for No. 11. Whyld completed this work and published the pamphlet in 1953 as the last of Cordingley's Limited Editions of Tournament Books. No. 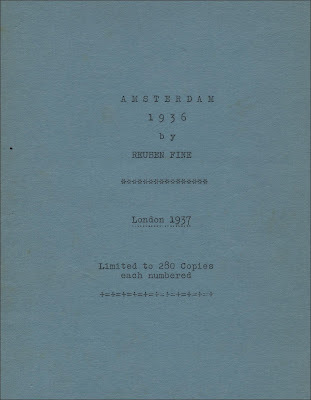 12 is Amsterdam 1936 published in 1937 in a smaller format. 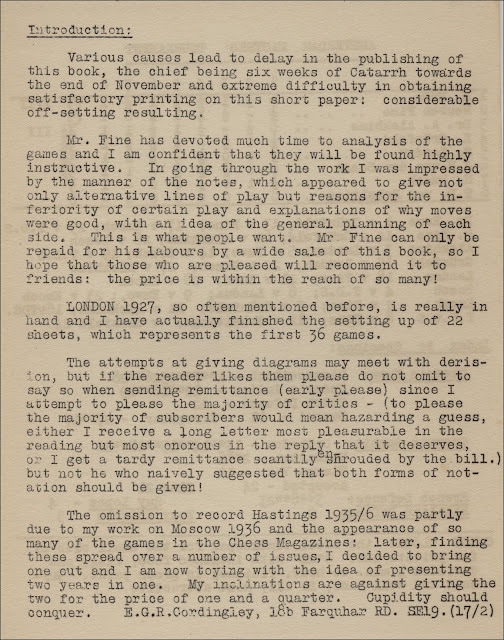 Cordingley engaged Reuben Fine, the joint winner, to analyse and annotate the games and, this time the notes were interspersed within the moves, making the games easier to follow. However, Cordingley's method of production, i.e. a standard typewriter, precluded normal chess diagrams, and grids with letters was the best that he could manage. These were difficult to fathom and probably received the derision that he had anticipated in his Introduction to this book. 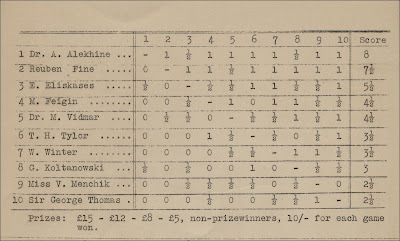 Although the 28 games are extensively annotated, there is no overall commentary on the eight player tournament, won by Fine and Euwe ahead of Alekhine. The List of Subscribers had grown to 76 entries. 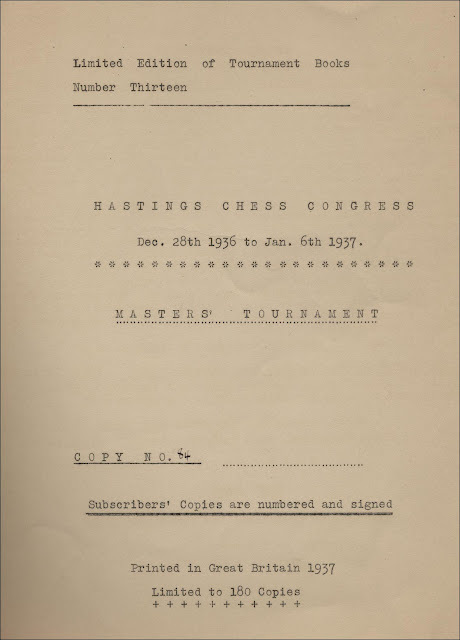 Next off the typewriter was Hastings 1936-37, won by Alekhine ahead of Fine and Eliskases. 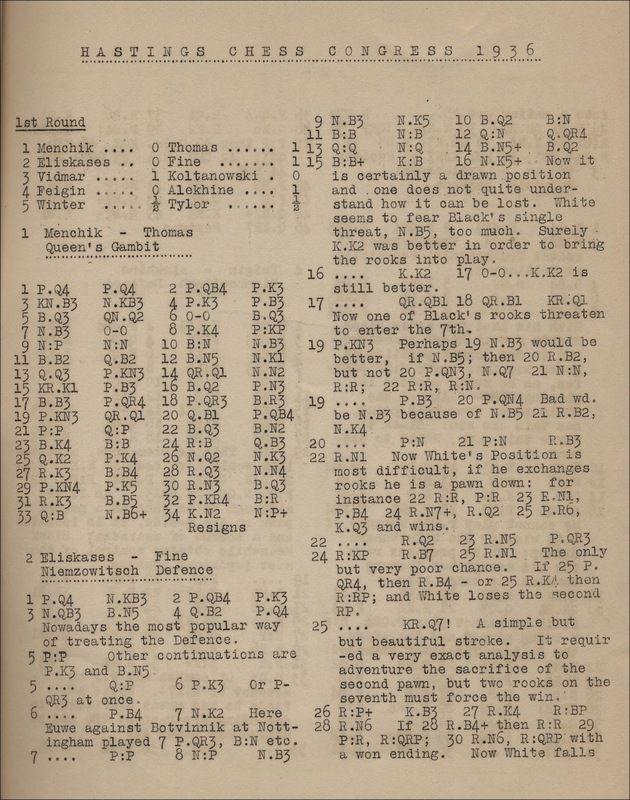 This 30 page publication was back to a larger format, and notes to the 45 games were taken from The British Chess Magazine and Chess. 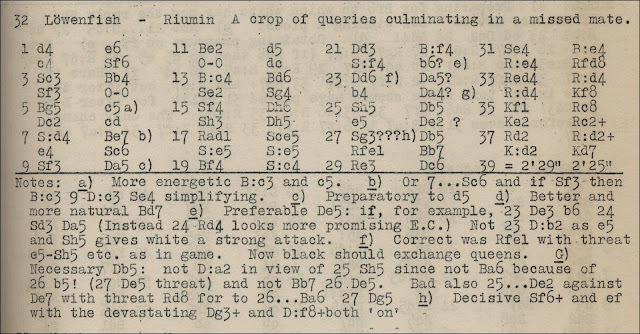 There is no introductory matter except for a cross table and index of openings. The book includes four of the awkward diagrams and a few adverts are squeezed in. 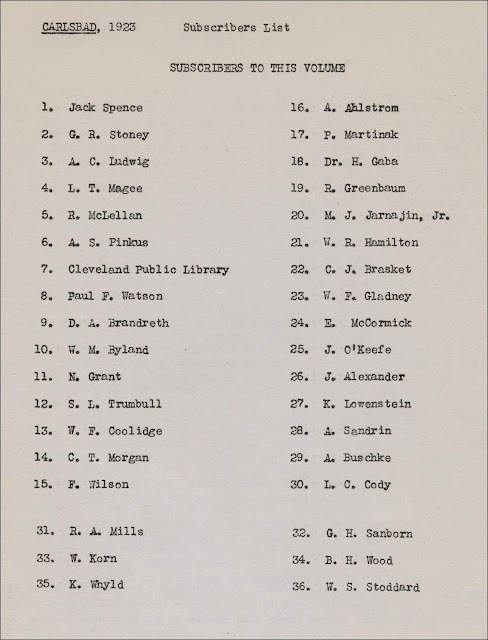 The List of Subscribers had reached 80. 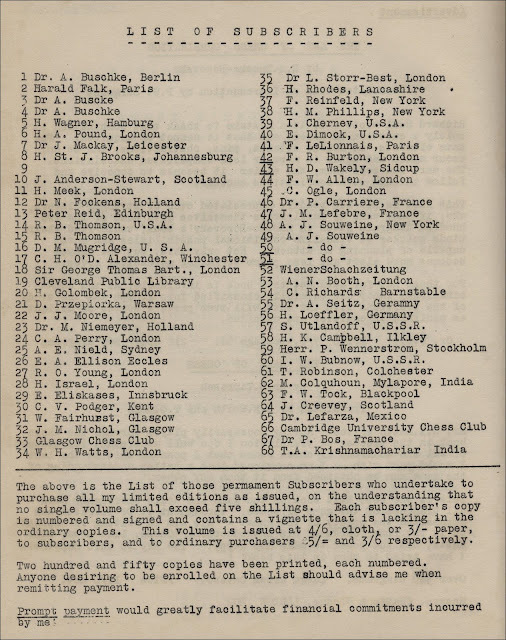 Incidentally, the numbers of copies printed according to Betts' Bibliography is not always correct. Moscow 1935 and Moscow 1936 both had 250 copies not 240 as stated in Betts, Amsterdam 1936 had 280 copies not 265 and Hastings 1936-37 had 180 copies not 140. I have amended the table given in a previous article and I shall be pleased to hear of any other discrepancies. 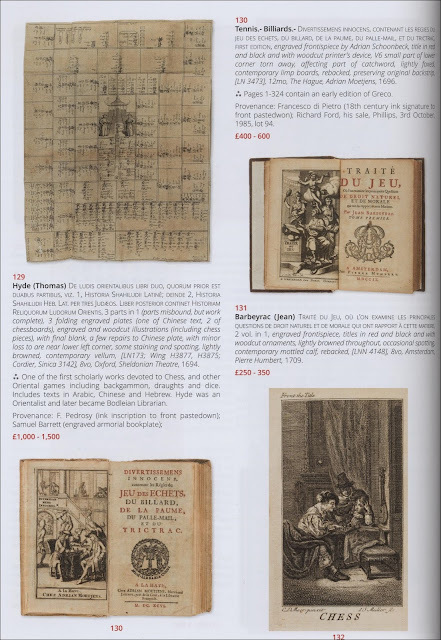 Forum Auctions of London held a sale of Fine Books, Manuscripts and Works on Paper on 28th March which included 24 choice chess lots from the collection of Michael Mark. Keen competition for many of the lots resulted in 14 items realising more than the top estimate. 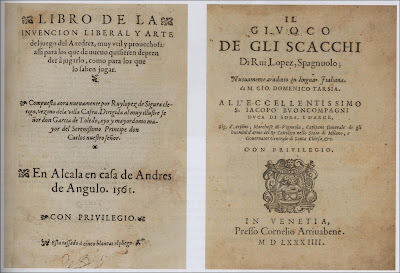 Libro de la Invencion Liberal Y Arte del Juego del Axedrez, published in Alcala in 1561, sold for £7,000, while the Italian translation by Giovanni Tarsia; Il Giuoco De Gli Scacchi, published in Venice possibly posthumously in 1584, made £2,400. 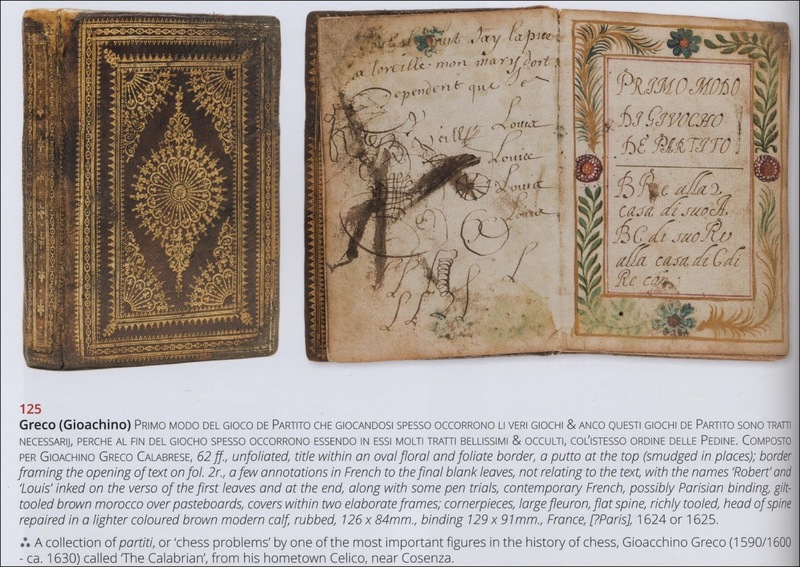 Next lot was the star of the show, a very rare manuscript of Greco's games, written in Italian but produced in France, possibly Paris in 1624 or 1625. The attractive hand decorated title page featured on the back cover of the auction catalogue and, despite a few blemishes, this small volume, measuring just 12.6cm x 8.4cm, attained £42,000 in the sale room. 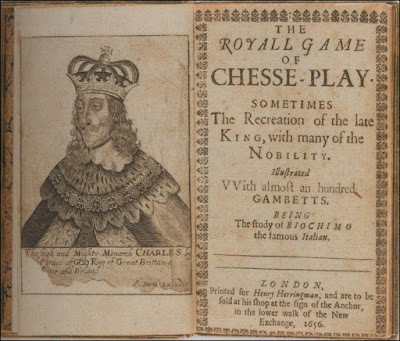 The first two English editions of Greco were among the lots, with The Royall Game of Chesse-Play, London 1656, selling for £2,200, while Chess Made Easy, London 1750, with some defects, made £550. 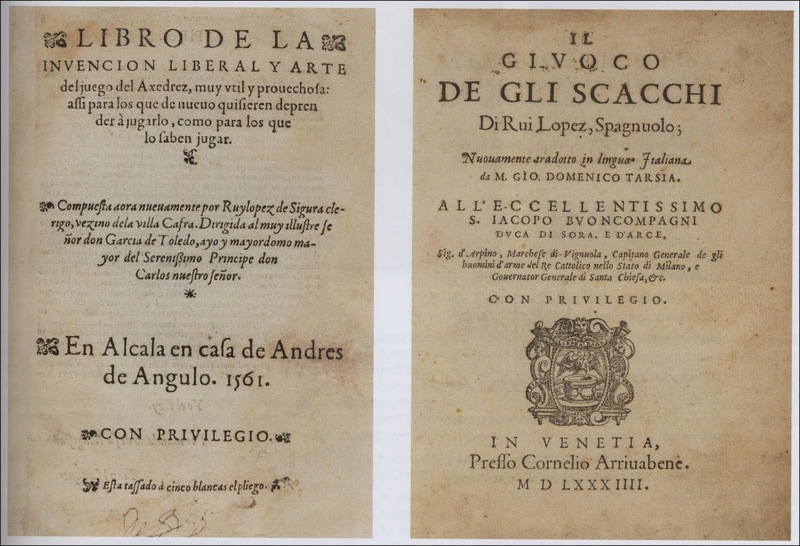 Several items came with impeccable provenances, including Salvio's Il Puttino, Altramente detto, Il Cavaliero Errante, Naples 1634, together with the 1634 reprint of his Trattato dell' Inventione et Arte Liberate del Giuco di Scacchi, previously owned by Sir Frederic Madden and J. W. Rimington Wilson. This sold for £2,400. 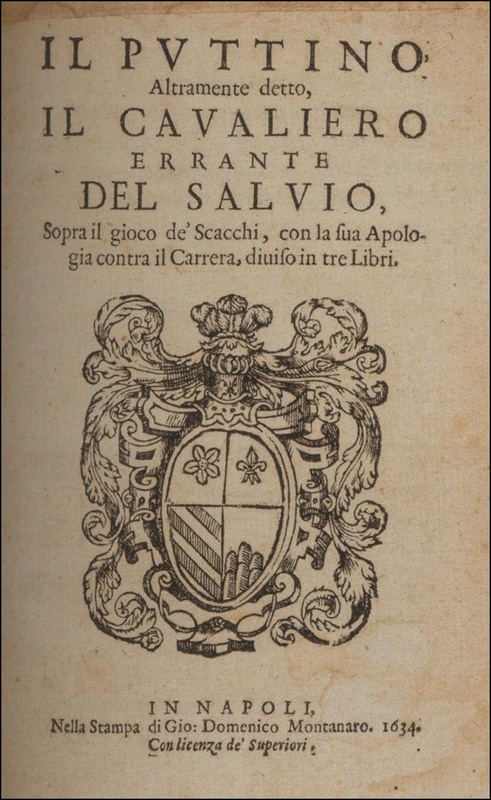 Severino's La Filosofa..., Naples 1690, came from the library of former French chess champion André Muffang (£1,600), and Philidor's Chess Analysed, London 1750 (£1,500) and Robert Lambe's The History of Chess, London 1750, (£600) both came from J. W. Rimington Wilson's library with his usual inscriptions. A curious composite work made up of the first volume of Chess by Twiss, London 1787, the chess part of his scarce Miscellanies, London 1805, and Nouvel Essai sur le Jeu des Échecs, The Hague 1789, was probably good value at £380, as was Hyde's De Ludis Orientilabus, including Mandragorias seu Historia Shahiludii which deals with the history of chess, Oxford 1694, realising £1,100. 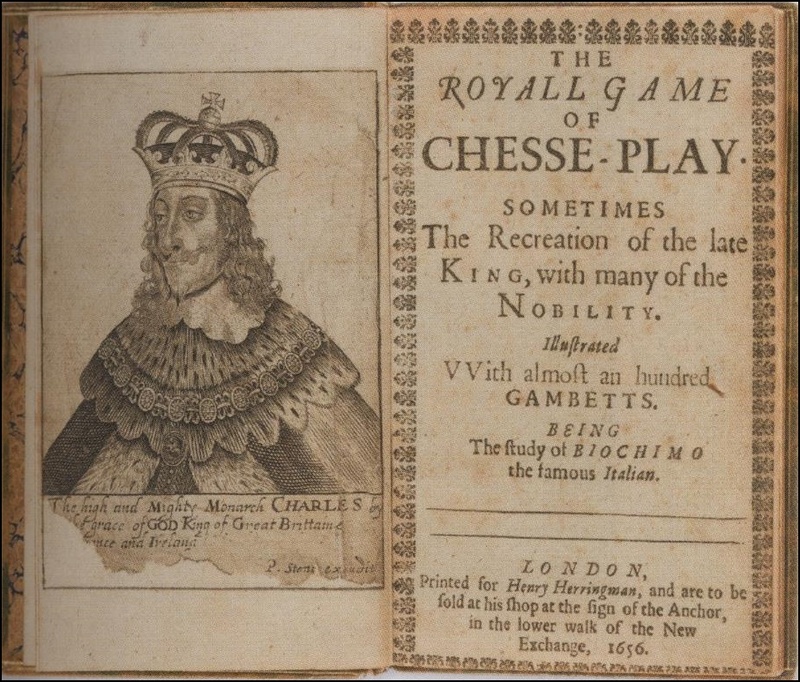 The Buke of ye Chess, of which only 40 copies were printed in Auchinleck, Scotland in 1818, sold for £1,100. 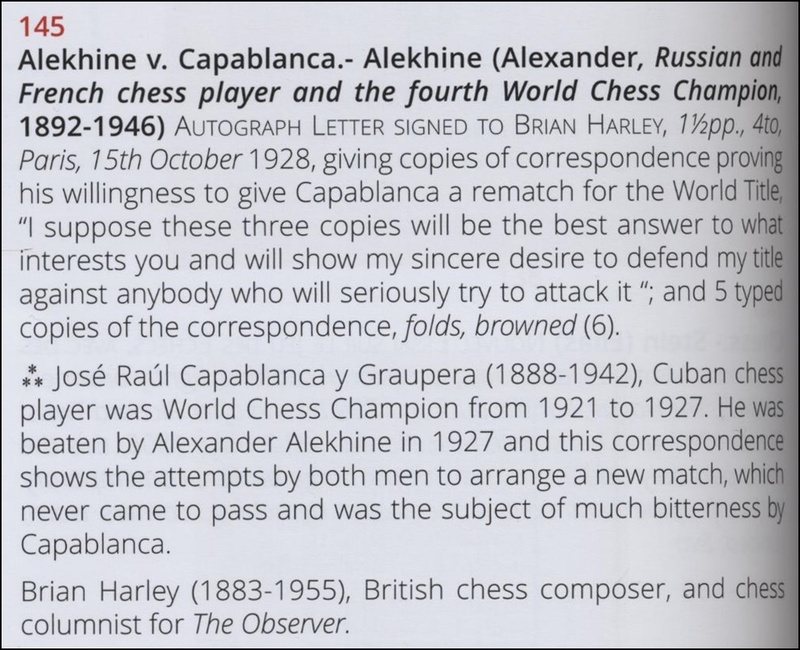 A very interesting letter from Alexander Alekhine to Brian Harley, dated October 1928, confirming his willingness to play a rematch with Capablanca sold for £2,800. 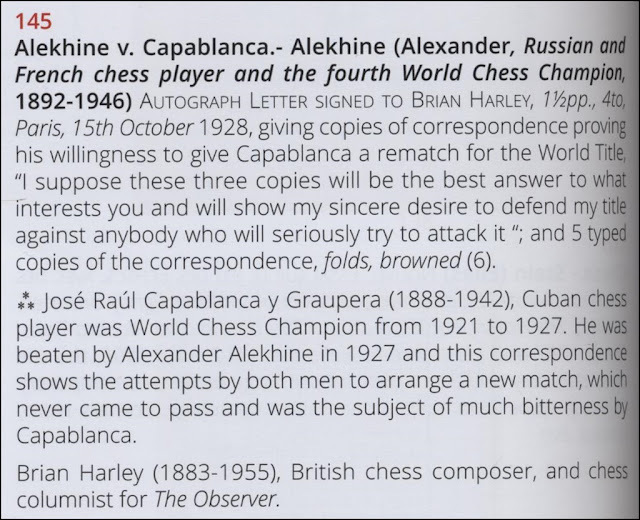 This lot also included five further contemporary copies of correspondence between Alekhine and Capablanca, Capablanca and Alekhine, Alekhine and Bogoljubow and Alekhine and Norbert Lederer, all regarding challenges to Alekhine's world championship. 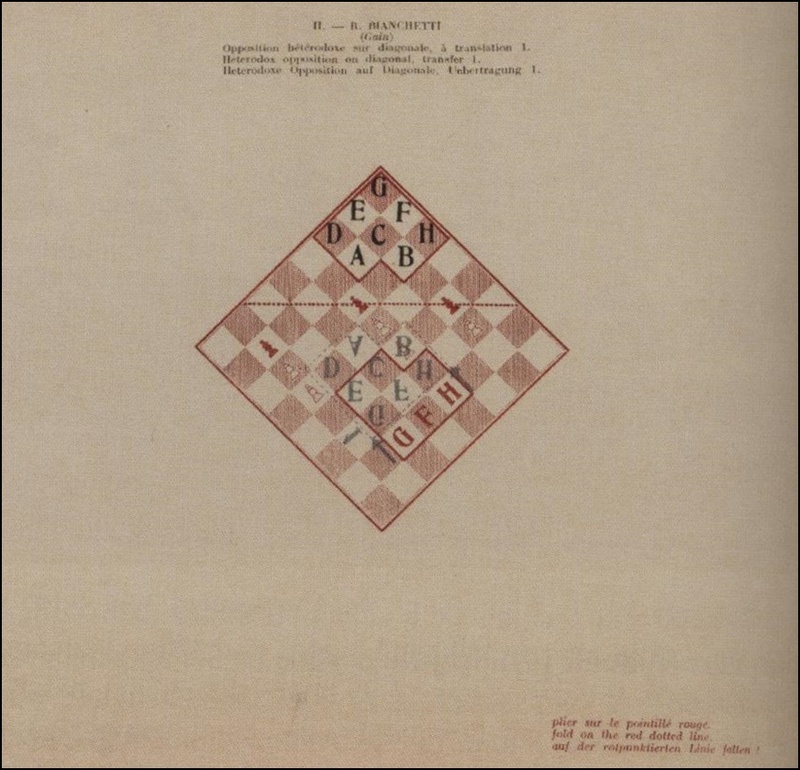 Marcel Duchamp's chess book L'Opposition et les Cases Conjuguées sont Reconcilées, written with Vitaly Halberstadt, Paris 1932, is always in demand and this example of the limited edition of 1,000 copies sold for £850, probably more for the Duchamp connection than the chess content. 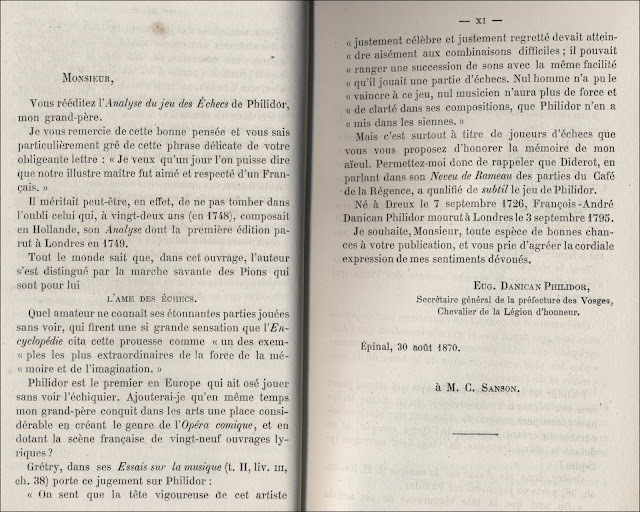 The text is in French, German and English but this work is not recorded in Betts' Bibliography. All of the aforementioned hammer prices do not include the buyer's premium of 25%. 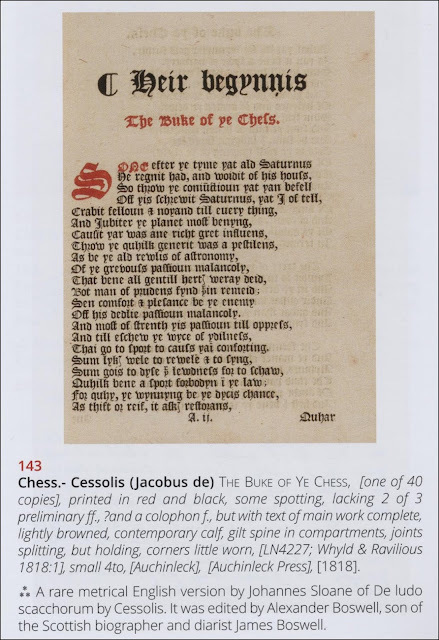 Many thanks to Rupert Powell of Forum Auctions for permission to include extracts and illustrations from the catalogue. A puzzling matter is how these auction houses manage to produce beautifully illustrated catalogues on high quality paper at modest prices while publishers of chess books such as McFarland claim that the cost of including quality colour illustrations in their books is prohibitive. Jack Spence, a lawyer from Omaha, Nebraska, USA, launched his series of limited editions in 1949, when in his early 20's, with a book on the 50th United States Open Championship which was held in his home town, and produced a total of 60 limited editions during the next 15 years. 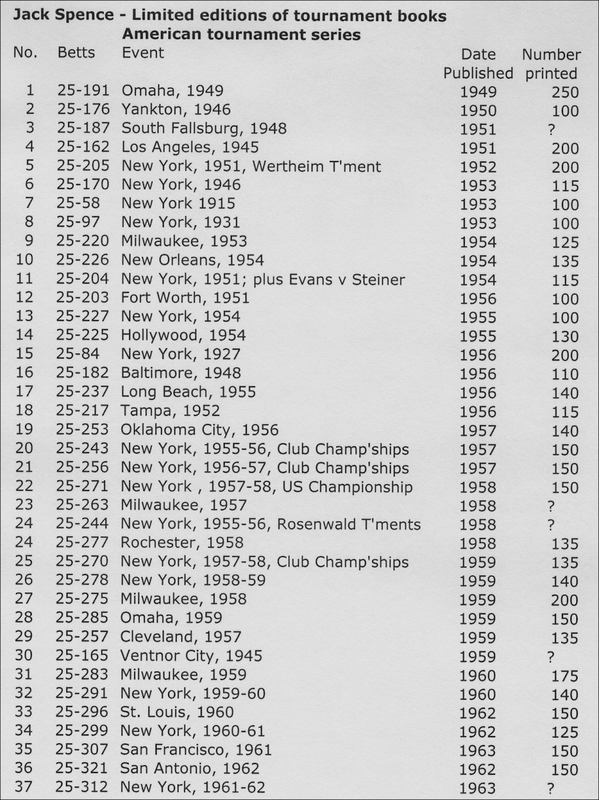 These were mainly records of contemporary American tournaments but he also revisited major tournaments from the past, and his Foreign Tournament Series included several important events from the 1920's and 1930's such as Carlsbad 1923, Bad Kissingen 1928, San Remo 1930, etc. 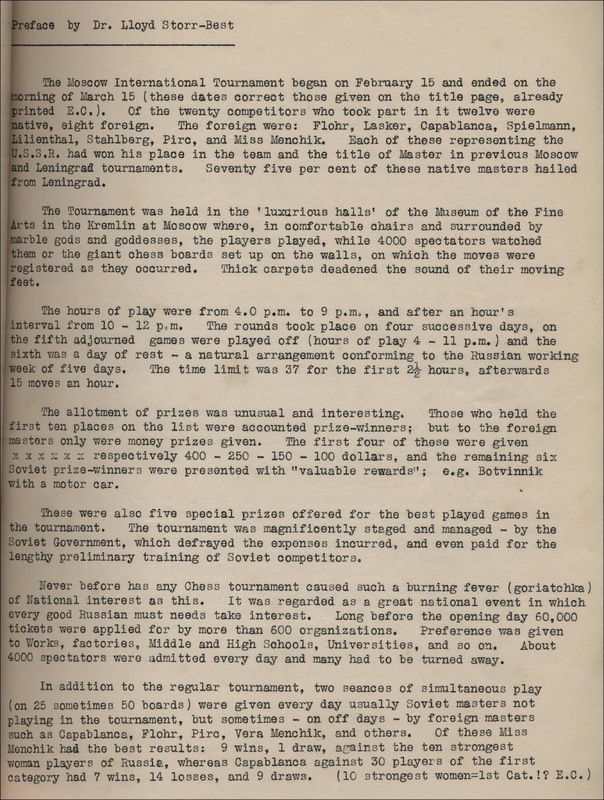 One of his aims was to present these tournament games for the first time in the English language. 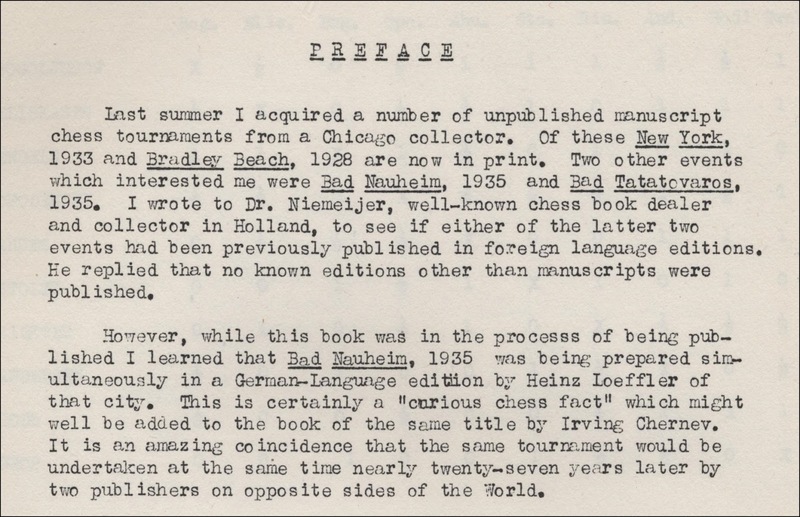 The books were generally mimeographed, printed on rectos only, and bound in card covers with a plastic ring binding. The Supplements were simply stapled sheets without covers. Each copy was numbered. However, adverts for the Omaha 1949 book, which I have not seen, emphasise that it was press-printed and includes many photos. These publications typically included a Preface and/or an Introduction giving details of the event covered and, occasionally, the source of the material, followed by cross-tables, brief but succinct round by round summaries, the games in descriptive notation (some books have light notes and comments, others do not), indices of games and openings, and usually a page of adverts for these limited editions. 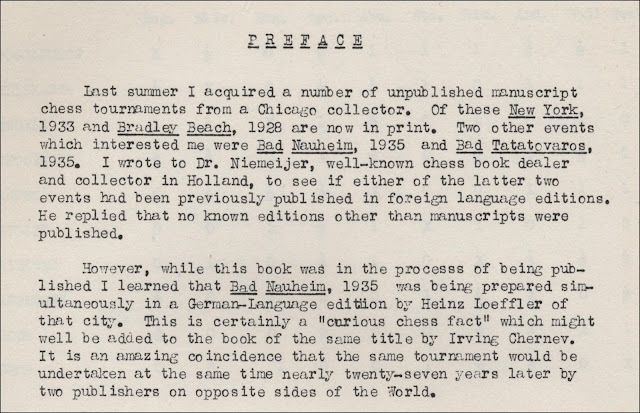 In the Preface to Bad Nauheim 1935, Spence states that the source of his material was the acquisition of a number of unpublished chess tournament manuscripts from a Chicago collector, and in the Preface to New York 1933 this collector was revealed to be Paul Little, noted chess bibliophile of Chicago. 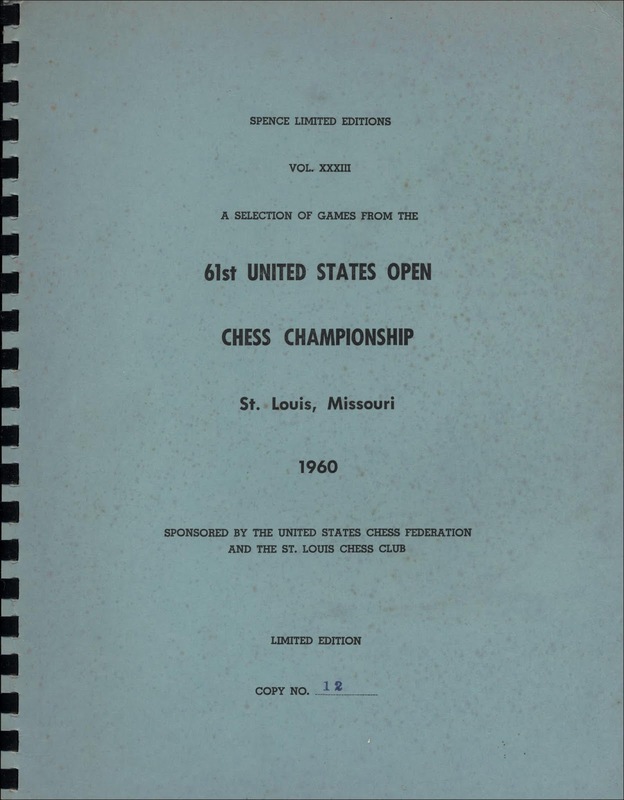 One of the smallest print runs was for his booklet on the United States Junior Chess Championship, Lincoln, 1955, with an issue of 75 copies, and I have already discussed this publication, along with United States Chess Championship, New York, 1957-1958, in a previous article on 6th February 2017, as these both featured Bobby Fischer. 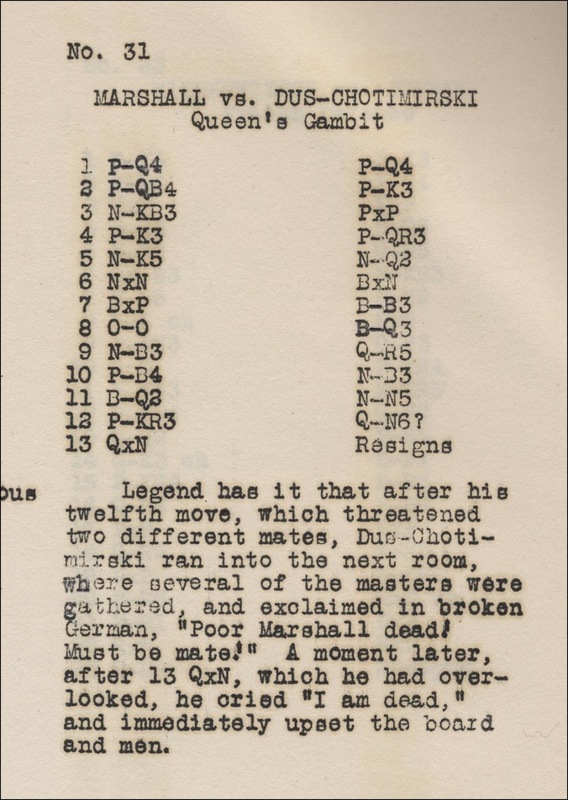 After ending his series of limited editions in 1963, Jack Spence continued editing tournament booklets for Tony Gillam's The Chess Player series. 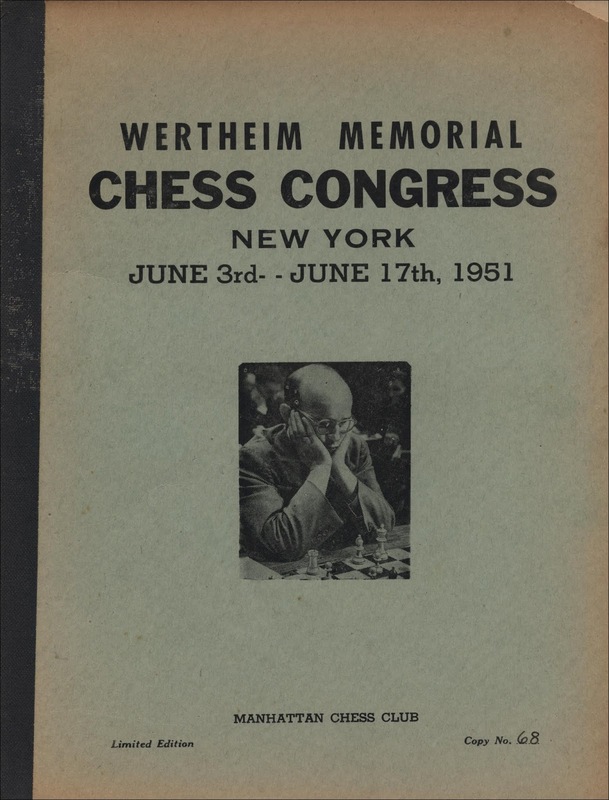 One of these was a re-typed edition of his own book on the Wertheim Memorial Chess Congress held in New York in 1951, as most copies had been poorly printed with only a few being completely legible. 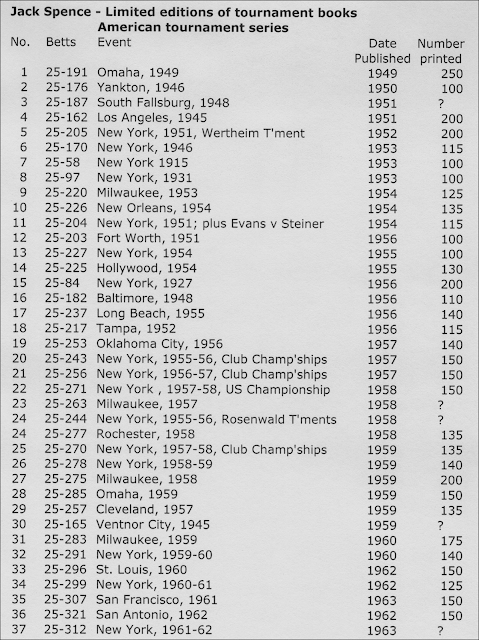 (See Betts 25-206). Spence died in 1978 aged 52. Richard McLellan from Omaha, Nebraska, produced five limited editions from 1958 into the 1960's in a style very similar to Spence's productions, down to the same pink card covers and plastic ring binding. However, his books were simply a record of the game moves with absolutely no narrative or comments, not even forenames for the competitors. 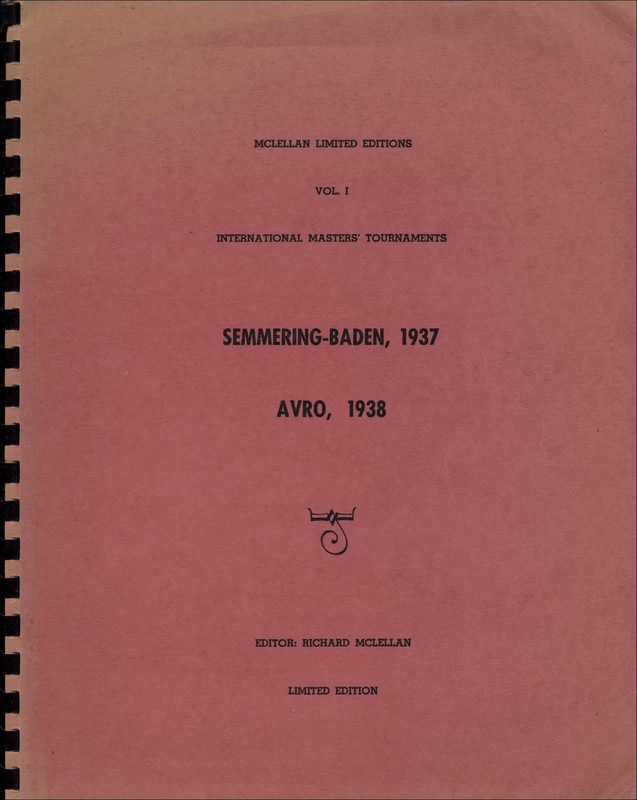 McLellan, who had earlier assisted Jack Spence by translating German texts for some of his works, published his first limited edition in 1958, covering the tournaments at Semmering-Baden, 1937 and Amsterdam (AVRO), 1938. 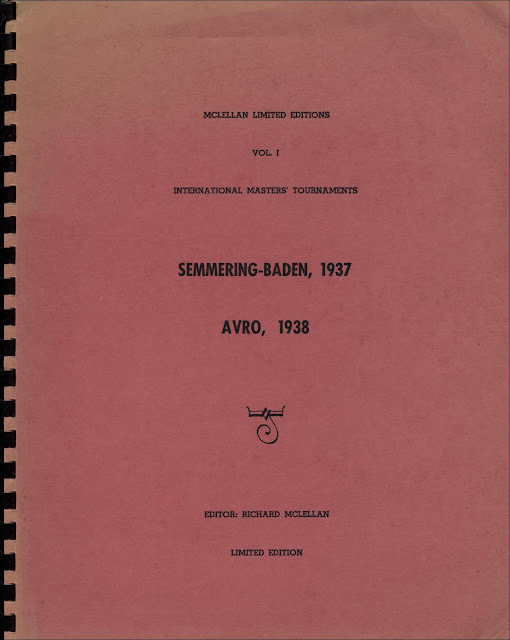 Semmering-Baden, 1937 had previously been the subject of Reinfeld's limited edition no. 7, published in 1938. 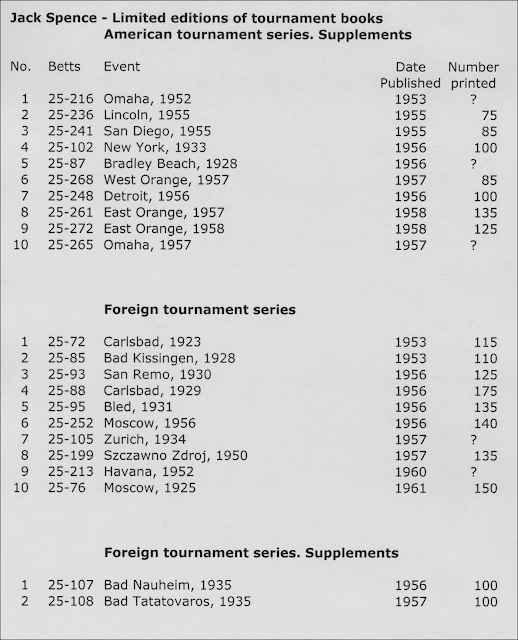 Both of these tournaments were won by Paul Keres ahead of Reuben Fine, and they had four world champions behind them at Amsterdam. All of McLellan's books covered European events from the 1930's and 1940's, including the match between Paul Keres and Max Euwe in 1939-1940 which had the smallest of his print runs with 120 copies. 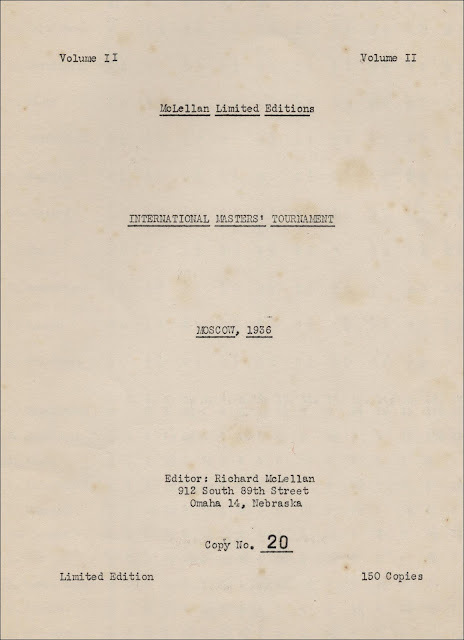 G. R. Stoney was a railroad timekeeper from, yes, you guessed it, Omaha, Nebraska, and he published his only limited edition in 1953 with a selection of games from the International Chess Tournament, Carslbad 1911. 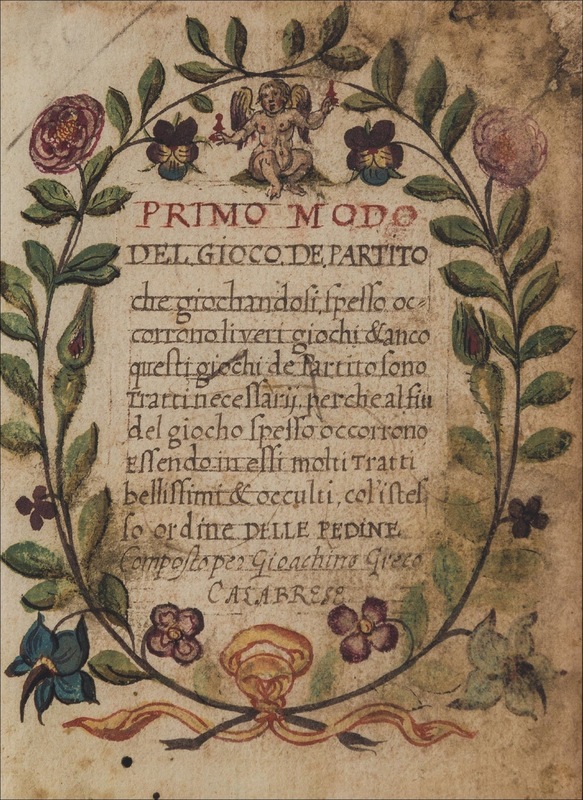 Only 100 copies were printed, mimeographed onto the rectos only and bound in pink card covers. 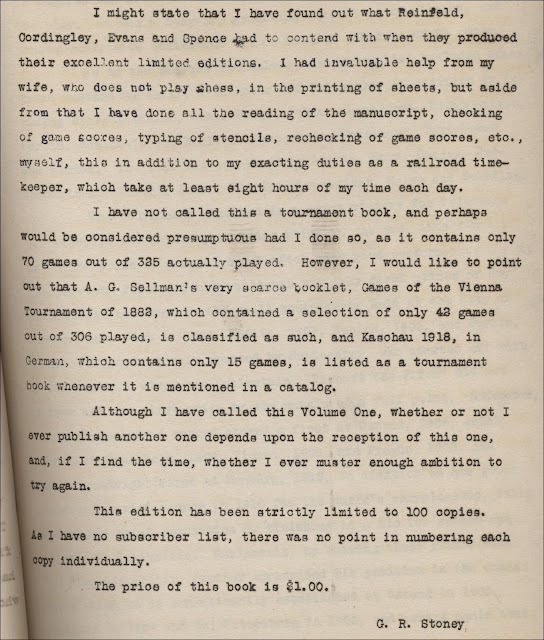 Stoney wrote an interesting two page Preface with details of the production of his "unassuming little volume", explaining that the games were compiled from various books, magazines and newspapers over a period of several years. 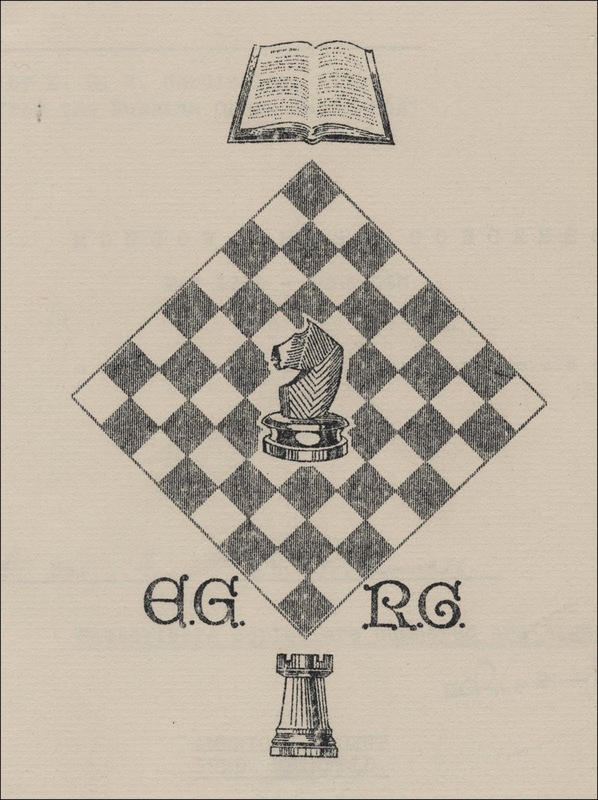 He had particularly drawn from the Year-Book of Chess, 1912, by E. A. Michell. He recognised the difficulties encountered by Reinfeld, Cordingley and Spence in producing their own limited editions, and left open the possibility of producing further volumes. 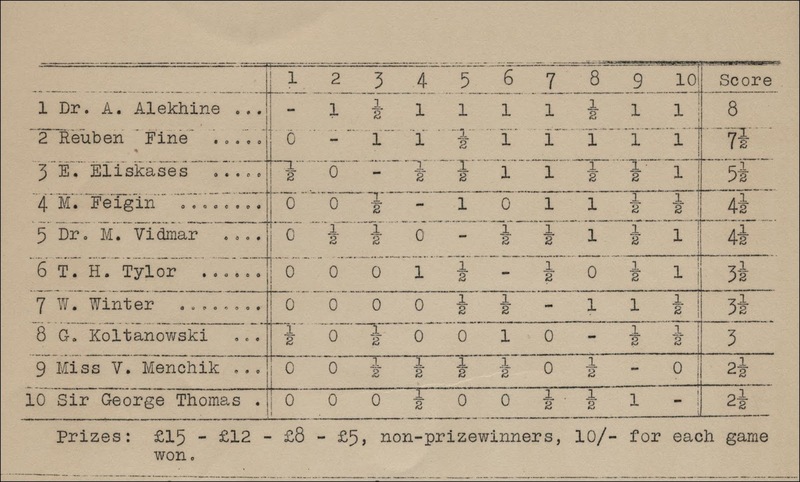 The two page Introduction gives an overview of this very strong 25 round tournament, won by Teichmann ahead of Rubinstein and Schlechter with Marshall, Niemzowitsch, Alekhine, Spielmann etc. behind. There is also a list of the twelve brilliancy prize games. Most games have occasional notes and comments by Stoney. Game 31 is Marshall's 13 move miniature against Dus-Chotimirski. More Limited Editions next time. Limited editions of tournament and match books have been a feature of English language chess books since 1891 when The Book of the Sixth American Chess Congress, 1889, by W. Steinitz, was published in an edition of 500. This was followed by The Games in the St. Petersburg Tournament, 1895-96, by James Mason and W. H. K. Pollock, Leeds 1896 (500 copies); The Book of the London International Chess Congress, 1899, by F. W. Lord and W. Ward-Higgs, London 1900 (500 copies); and The World's Championship Chess Match played at Havana between Jose Raul Capablanca and Dr. Emanuel Lasker, by Hartwig Cassel, New York 1921 (600 copies). 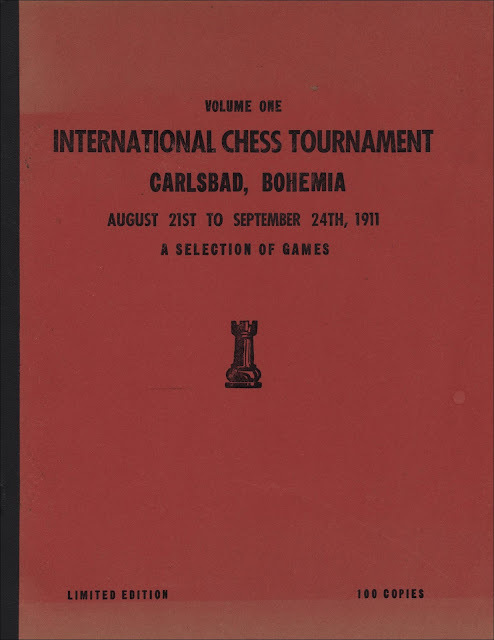 Then, from the 1930's, a number of authors published series of limited editions, in much smaller numbers, frequently on past tournaments which had not previously been accorded a tournament book. E. G. R. Cordingley led the way with 18 limited editions published between 1933 and 1953. 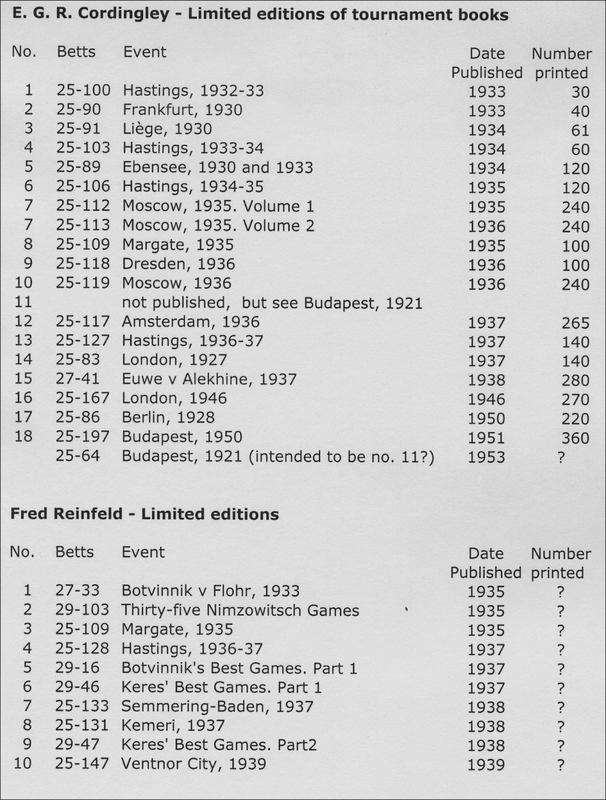 His first, on Hastings 1932-33 was limited to just 30 copies, followed by Frankfurt 1930 in an edition of 40. 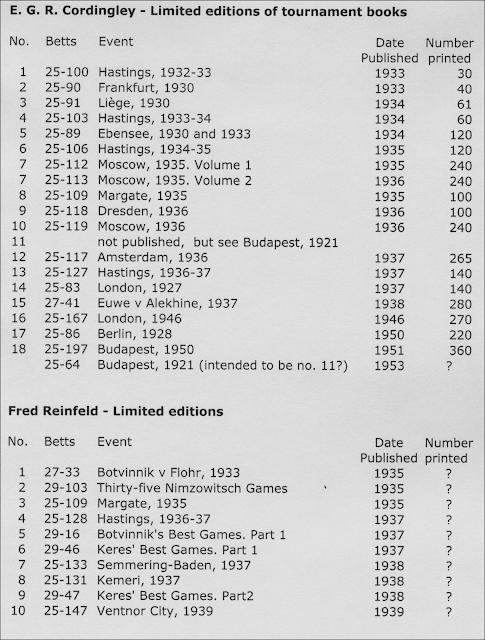 Fred Reinfeld followed soon after, publishing ten limited editions between 1935 and 1939, with five tournament books, one match book, and four games collections. 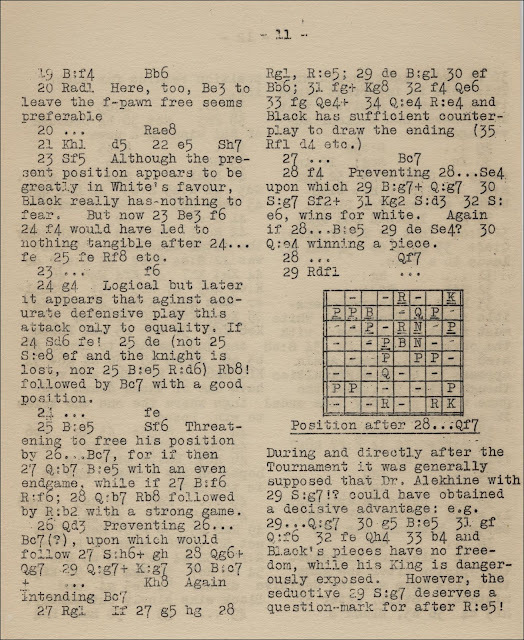 Reinfeld did not state the number of copies printed for any of these, but The British Chess Magazine reported on page 314 of the July 1935 issue that his second book in the series would be limited to 150 copies. Cordingley no. 8 and Reinfeld no. 3 on Margate 1935 are the same book, but Cordingley no. 13 and Reinfeld no. 4 on Hastings 1936-37 are different works. 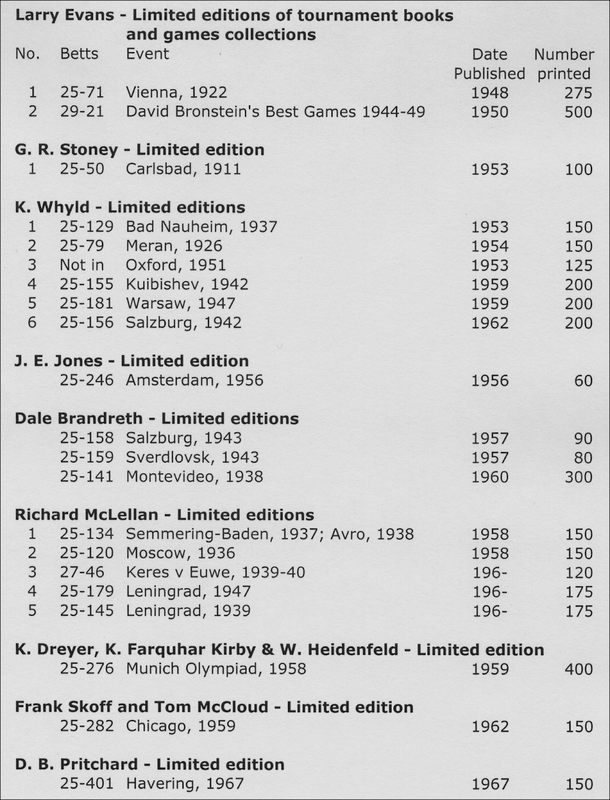 The king of the limited edition tournament book has to be Jack Spence, with 60 books issued from 1949 to 1963. 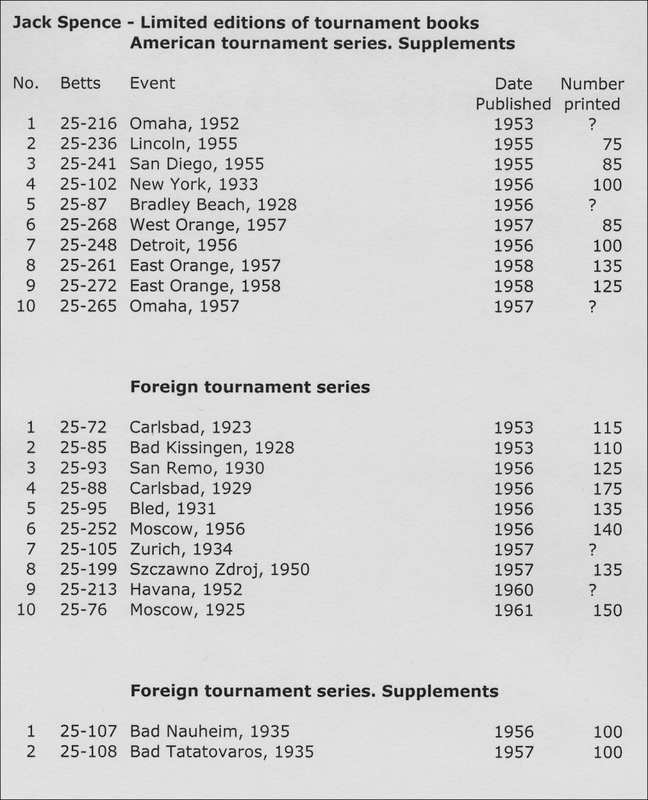 These were divided between his American Tournament Series (38 books), American Tournament Series Supplements (10), Foreign Tournament Series (10) and Foreign Tournament Series Supplements (2). The first Spence Limited Edition, on Omaha, 1949, had the largest print run of all of his books at 250, others varied between 75 and 200. Larry Evans published two limited editions in 1948 and 1950 with runs of 275 and 500 respectively. 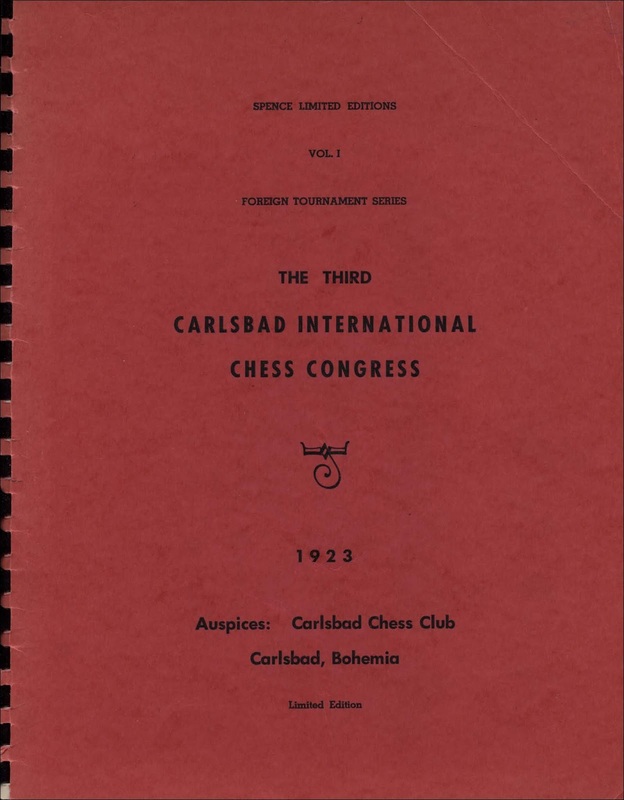 G. R. Stoney commenced a series of limited editions with a book on Carlsbad 1911, published in 1953, however, there were no further books in this series. 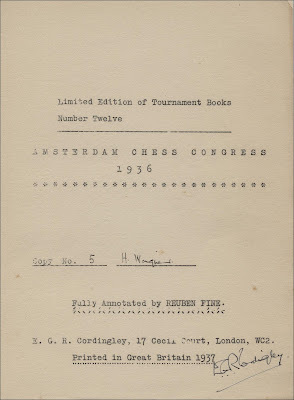 Ken Whyld completed Cordingley's final limited edition in 1953, on the Budapest 1921 tournament, and then issued six of his own between 1953 to 1962, with print runs of 125 to 200. 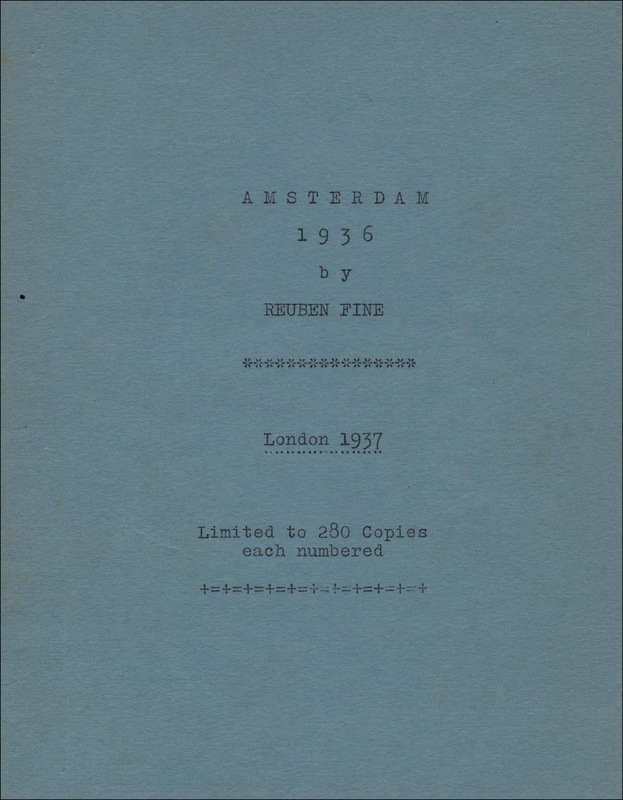 J. E. Jones published one limited edition book on Amsterdam 1956 in the same year, printing just 60 copies. 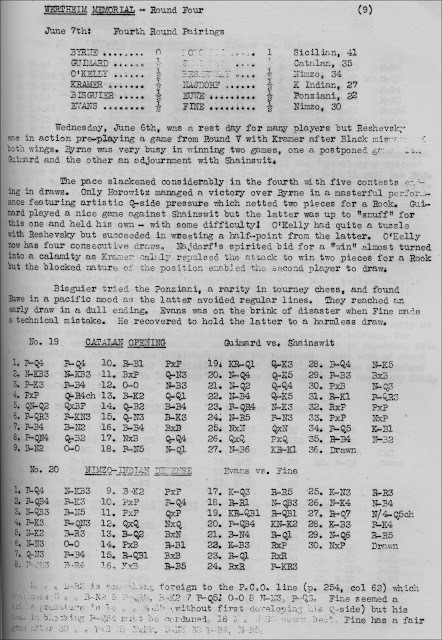 Dale Brandreth issued three limited edition tournament books from 1957 to 1960, and, although not part of his limited edition series, his collection of games between Lasker and Pillsbury was limited to 700 copies. Richard McClellan published five limited editions from 1958 to early 1960's, mainly on events from the 1930's, with print runs of between 120 and 175. The book on the Munich Olympiad of 1958, featuring games of the South African team, by K. Dreyer, K. Farquhar and W. Heidenfeld was limited to 400 copies. In 1962 Frank Skoff and Tom McCloud produced a limited edition of 150 on Chicago, 1959. 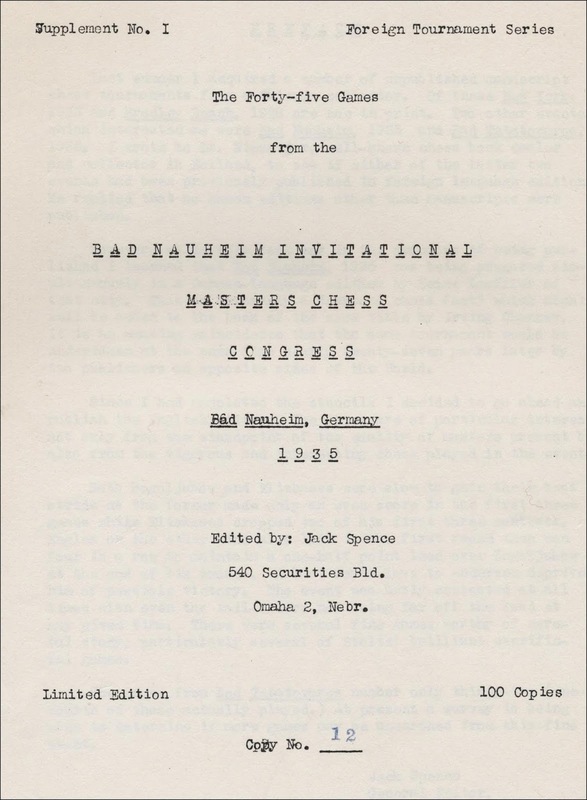 Finally, D. B. Pritchard's book on Havering, 1967 was limited to 150 copies. I will have a closer look at some of these limited editions next time. 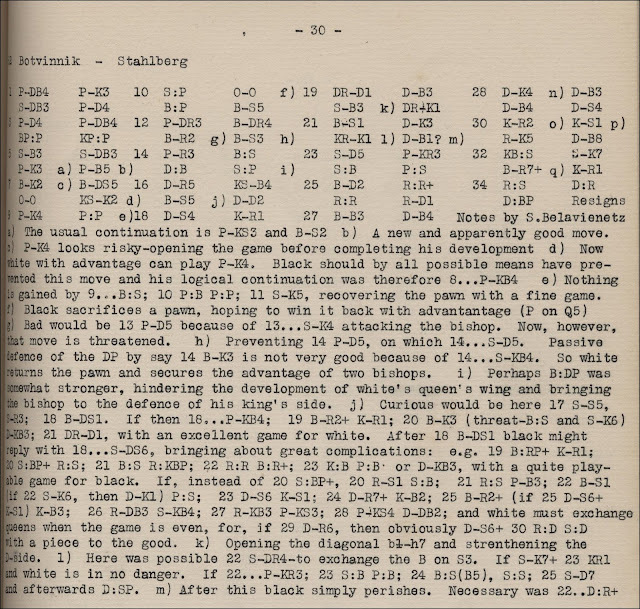 There are no doubt other examples and I note that Di Felice's Chess Competitions 1824 - 1970 includes an English language pamphlet, published circa 1960, on Sverdlovsk 1942 with a limited edition of only 16 numbered copies, at 2129.1. Limited editions continued to be published into the 1970's with books by Dale Brandreth, Tony Gillam, and probably others. New chess manuals based on Philidor's Analyze were still being published in the 1860's, 120 years after the publication of Philidor's original work L'Analyze des Echecs in 1749. 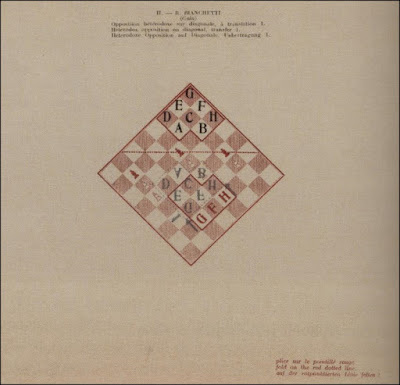 One of the last "new" Philidorian texts published in the 19th century was Analyse du Jeu des Échecs, par A. D. Philidor, Nouvelle Édition, corrigée, enrichie de variantes et illustrée de nombreux diagrammes, suivie d'un supplément d'études sur les fins de parties; by C. Sanson, Paris 1868. 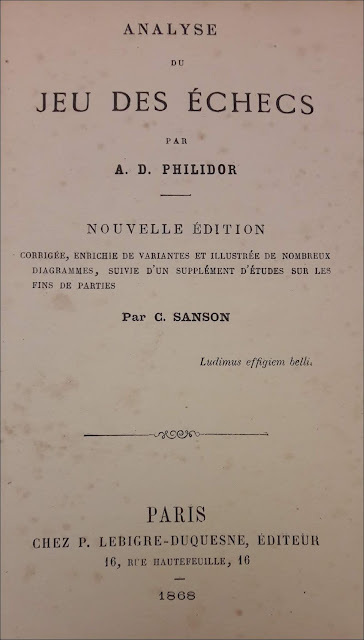 Analyse du Jeu des Échecs par A. D. Philidor; édition augmentée de soixante-huit parties jouées par Philidor: du Traité de Greco; des débuts de Stamma et de Ruy-Lopez, par C. Sanson, Paris 1872. 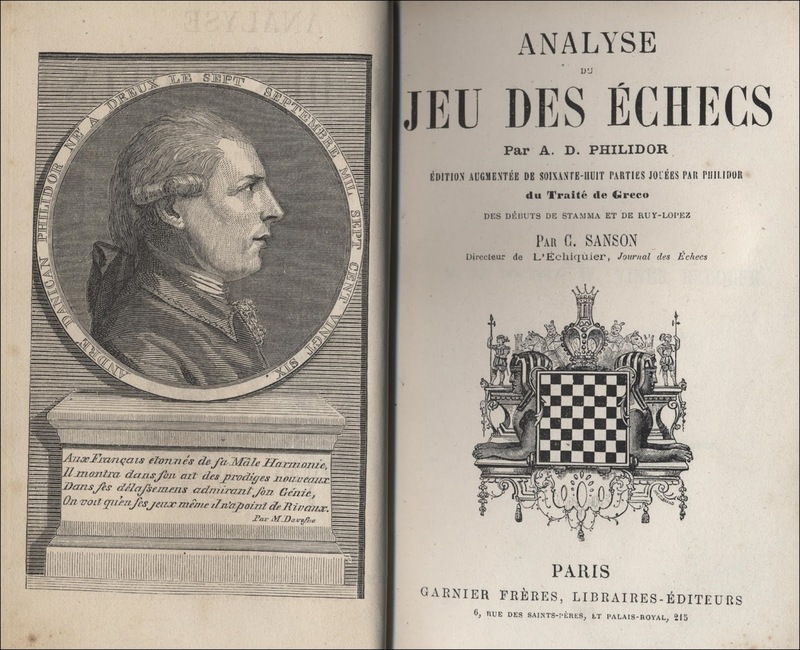 This edition, enlarged from 396 pages to 504 pages, includes 106 pages of Philidor's openings analysis, followed by the Études de Fins de Parties from the earlier edition, plus 68 of Philidor's games from the 1780's and 1790's. These are probably the 68 games recorded by George Atwood, many of which were subsequently published by George Walker in A Selection of Games at Chess, actually played by Philidor and his Contemporaries, London 1835. It is indeed unfortunate that no earlier games by Philidor survive. The book also includes a Traité de Jeu des Échecs par Gioachino Greco with a six page Préface by Sanson and 127 pages of Greco's "games", openings analysis and a few endings. This is followed by a Traité de Stamma with 15 pages of Stamma's opening analysis and finally an 11 page Traité de Ruy-Lopez. 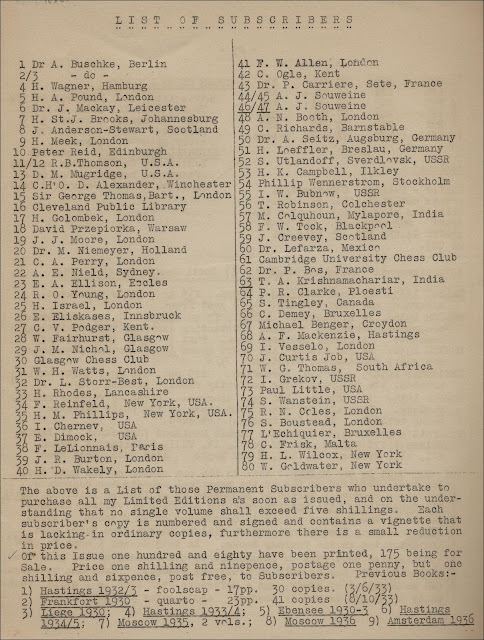 However, not only does this book present, in one handy volume, the openings analyses of four of the most important players and writers in the history of chess, but this tome also includes three interesting bibliographies. Firstly, a Bibliographie Chronologique des éditions publiées de L'Analyse de Philidor is given on pages 300 to 306 listing 65 works from 1749 to 1870. This is followed by a Catalogue de la Bibliothèque de C. Sanson on pages 307 to 332, detailing 270 items, and finally, pages 470 to 472 contain a Bibliographie des éditions publiées de Greco Calabrois. Sanson states that the first English edition of Philidor's book, Chess Analysed, London 1750, is in two volumes, but this is just a single volume. There is no mention of Chess Made Easy, published in several editions from 1797 to 1820, all of which included examples from Philidor, or The Elements of Chess, Boston 1805, or Pohlman's book, Chess Rendered Familiar, London 1819. 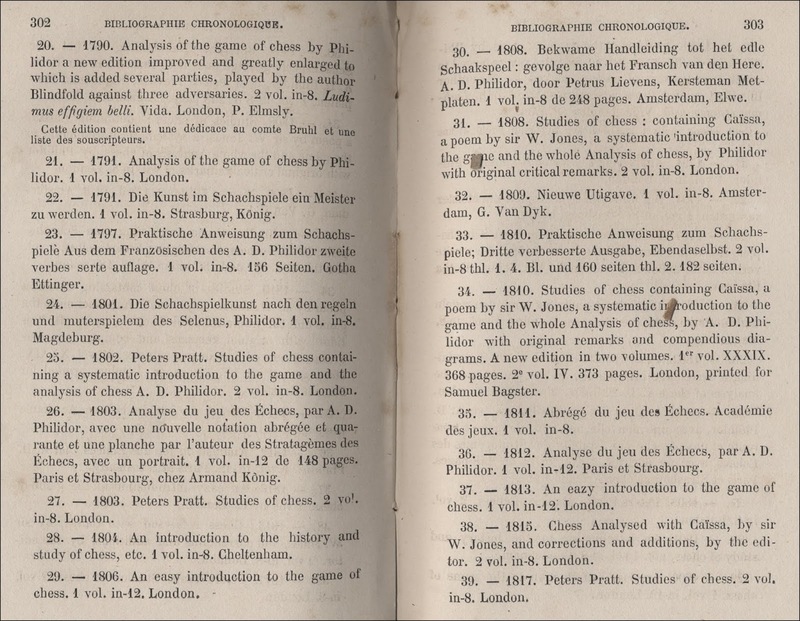 Furthermore, several editions of some of the books listed are omitted, such as the 1773 and 1787 editions of Chess Analysed. Sanson records an 1802 edition of Studies of Chess by Peter Pratt, who he persistently refers to as Peters Pratt. 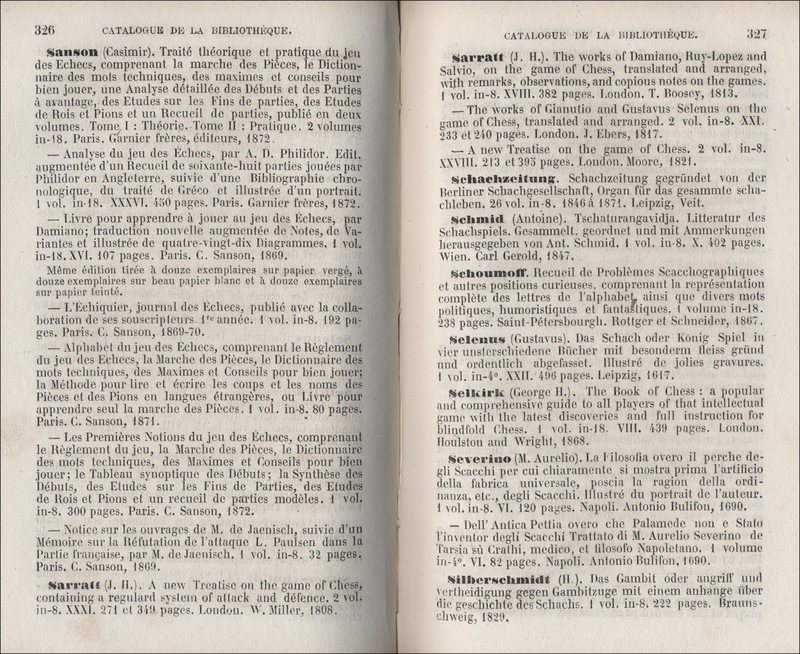 However, the first known edition of this book was published in 1803, which Sanson also records. Item 38 in the Bibliographie is: 1815 - Chess Analysed with Caissa, by Sir W. Jones, and corrections and additions, by the editor. 2 vol. in-8. London. 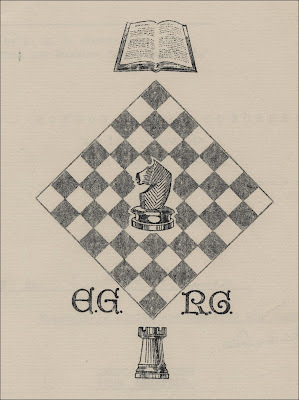 Another unknown work, this is possibly the 1814 edition of Studies of Chess. 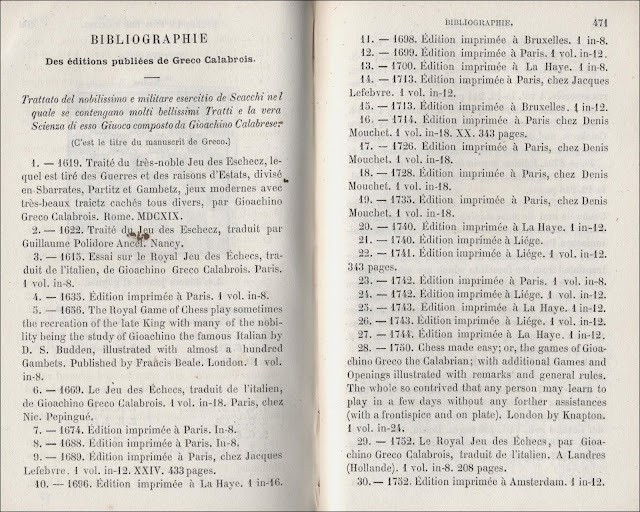 Curiosly Sanson dates the first edition of his own book at 1869 instead of 1868, probably just a slip. Sanson had an impressive library, with a number of scarce books from the 17th and 18th centuries including Salvio 1604, Selenus 1617, Greco 1689, Severino 1690, Bertin 1735, Stamma 1737, Philidor 1749, Ercole del Rio 1750, Lolli 1763, Ponziani 1782 and others. But his library was particularly strong on, what were to him, modern books of the early and middle 19th century, with around 250 books from this period. His Catalogue is a little disorganised and has several errors in names, titles etc. For example, he names the author of Chess Strategy, 1865, as Brown (Robert) of Bridport, and Emmett J. F. and Devian Fenton as authors of One Hundred Chess Games, 1865. 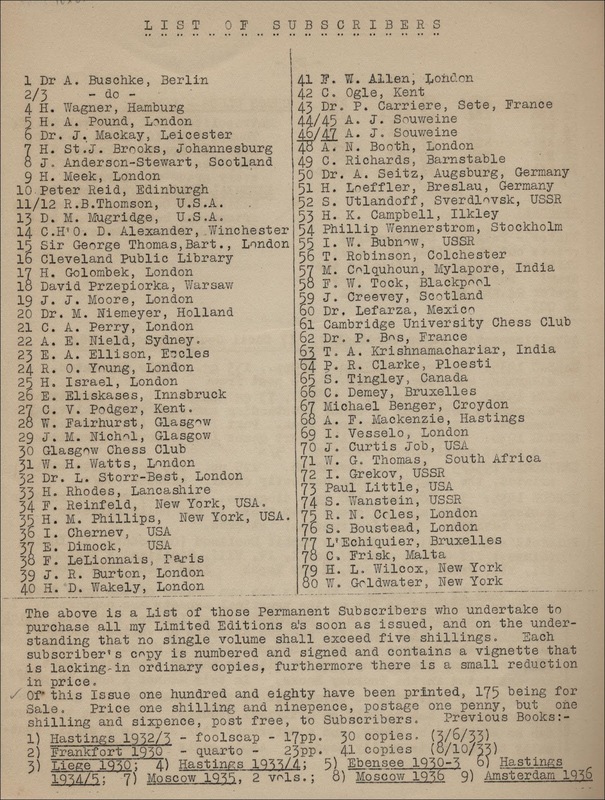 The English edition of Max Lange's book Paul Morphy: A Sketch from the Chess World, is listed under Falkbeer but the German edition is listed under Lange. The Accomplished Chess-Player, by Roy Reuben, 1834, is listed under Franklin R. etc. Nota. - Dans notre Traité Théorique et Pratique, nous donnerons un Catalogue des ouvrages publiées sur le jeu des Echecs, qui ne se trouvant pas dans notre bibliothèque. 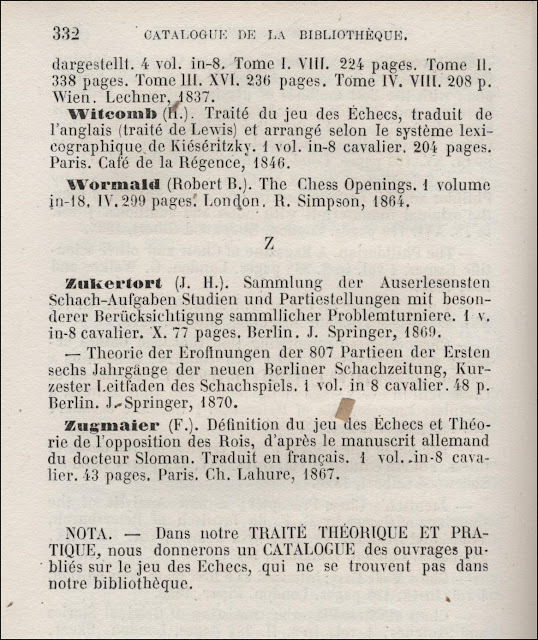 This is Sanson's revision of Traité Théorique et Pratique du jeu des Échecs, first published in Paris in 1775, and he lists his work in his Catalogue as published in two volumes (Tome I: Théorie, Tome II: Pratique) in 1872 by Garnier Frères in Paris. 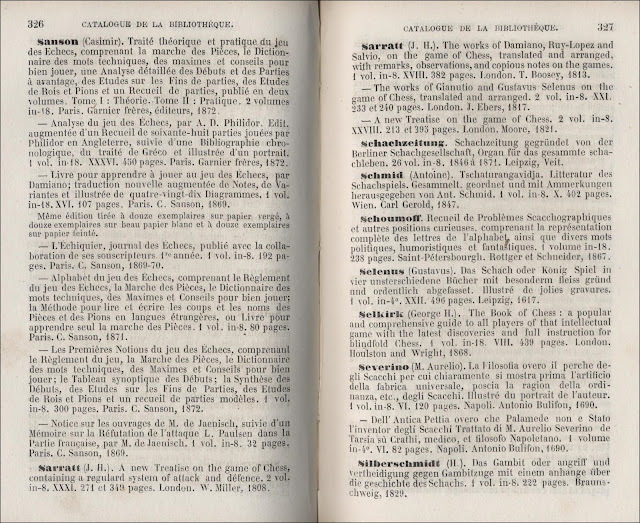 However I cannot find this in any bibliographical record, although a fourth edition of this work was published in Paris in 1873 by Delarue with no mention of two volumes or C. Sanson. See LN 541 and Kieler Schachkatalog 3341. 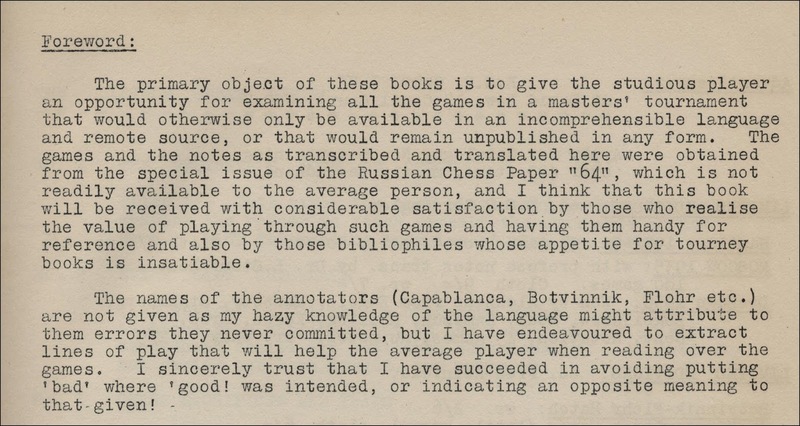 Either way, I haven't seen a copy so I do not know if this includes the list of chess publications not in Sanson's own library. 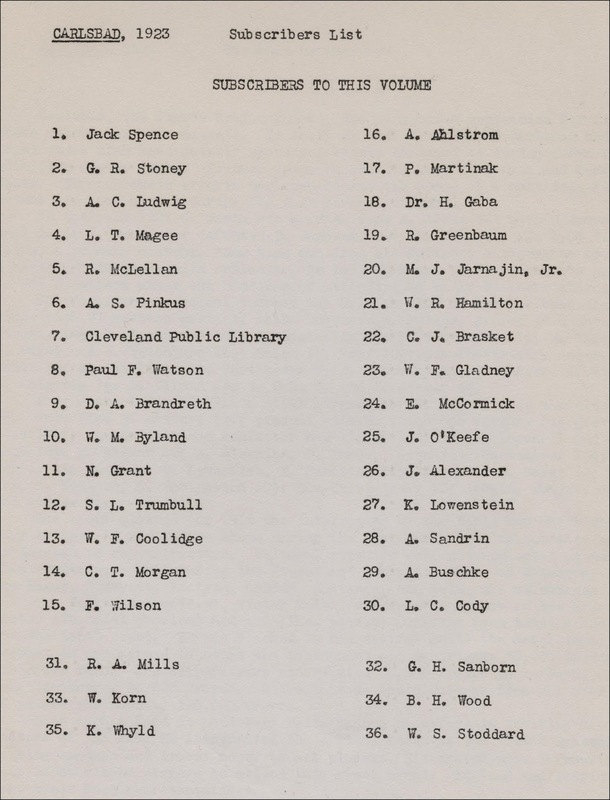 Furthermore, this list is not mentioned in Aucta, although Sanson's three other bibliographical efforts are listed at 1038, 1039 and 1040. 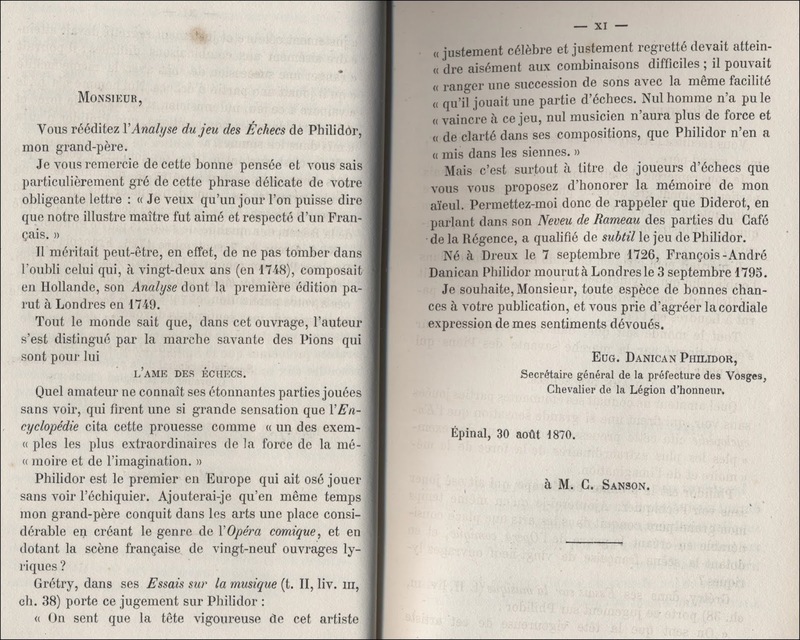 Casimir Sanson died in 1873 aged just 35, according to Gaige's Chess Personalia, but his edition of Analyse du Jeu des Échecs was reprinted many times over the next 60 years. I have a copy on poor paper with an imprint dated 1922 and Owen Hindle has a copy dated 1931 with attractive pictorial wrappers. 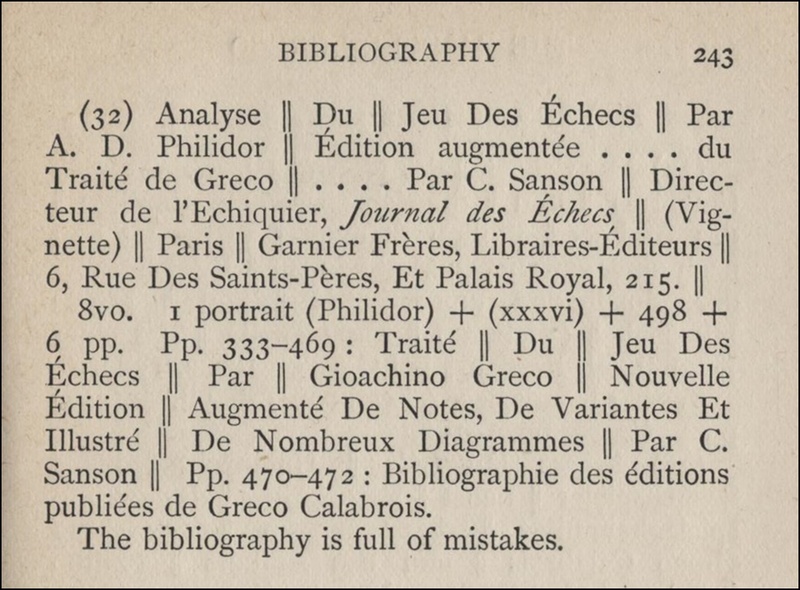 The bibliography of Greco lists 43 items from 1615 (which is almost certainly incorrect) to 1857, including a couple of manuscript items. 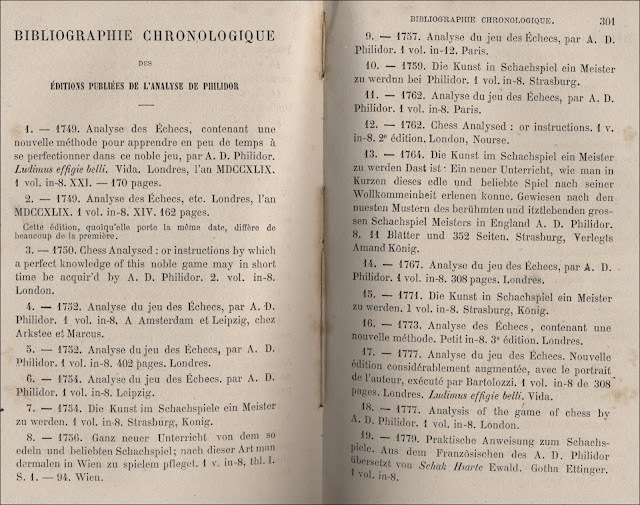 This compares with extensive details of twenty manuscripts and 47 books in Joseph Leon's The Bibliography of Greco in The Games of Greco by Professor Hoffmann, London 1900. 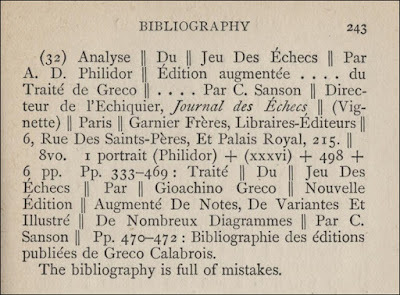 Leon's list includes eight post 1857 works, indicating that Sanson's list of Greco books was fairly complete, however, Leon dismisses Sanson's list thus: "The bibliography is full of mistakes"
Other notable items in Sanson's Analyse du Jeu des Échecs include a letter from Philidor's grandson Eug. 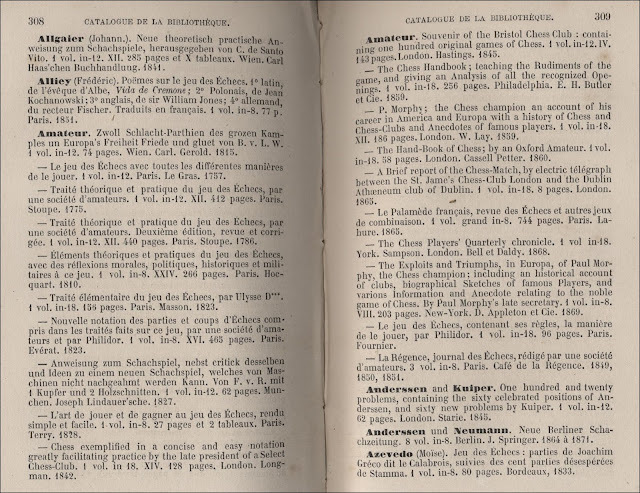 Danican Philidor dated August 1870, the Liste des Souscrivans from Philidor's first edition of 1749, and the Préfaces from both the 1749 edition and the second edition of 1777. 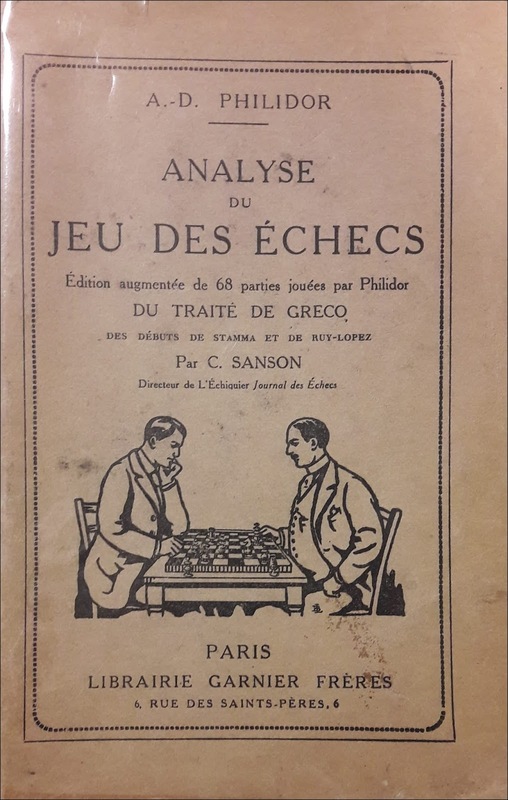 Incidentally, two uncharacteristic slips in The Oxford Companion to Chess regarding Philidor: The 1984 first edition of the Companion gives the title of Philidor's first book as L'analyse du jeu des Échecs instead of L'analyze des Echecs; this was corrected in the New Edtion of 1992. 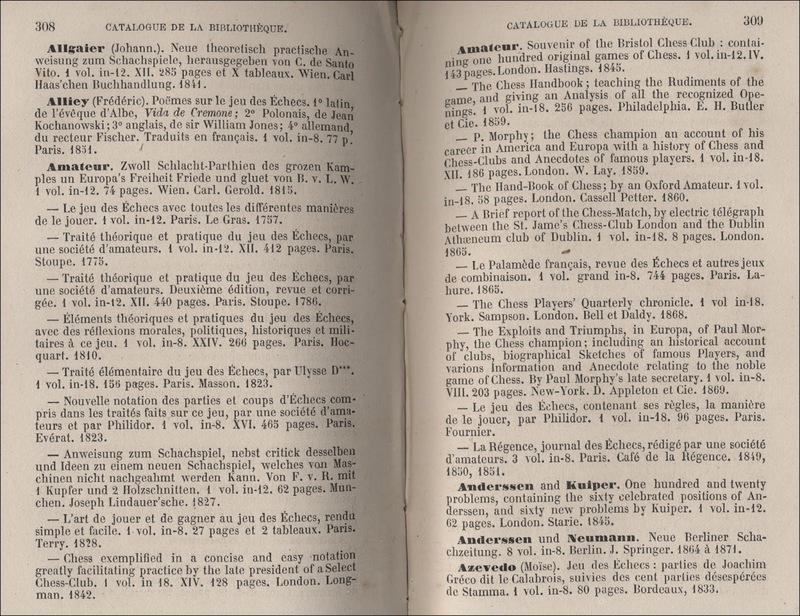 The New Edition (page 304) gives 1795 as the date of the third English edition of Philidor's book, this should be 1790. Many thanks to Jurgen Stigter and Owen Hindle for images of the 1868 and 1931 editions respectively.